Well, around 3 AM my time (northeastern Pacific, northern CA) there was a sequence of earthquakes including a mainshock with a magnitude M = 7.5. This earthquake happened in a highly populated region of Indonesia. This area of Indonesia is dominated by a left-lateral (sinistral) strike-slip plate boundary fault system. Sulawesi is bisected by the Palu-Kola / Matano fault system. These faults appear to be an extension of the Sorong fault, the sinistral strike-slip fault that cuts across the northern part of New Guinea. There have been a few earthquakes along the Palu-Kola fault system that help inform us about the sense of motion across this fault, but most have maximum magnitudes mid M 6. GPS and block modeling data suggest that the fault in this area has a slip rate of about 40 mm/yr (Socquet et al., 2006). However, analysis of offset stream channels provides evidence of a lower slip rate for the Holocene (last 12,000 years), a rate of about 35 mm/yr (Bellier et al., 2001). Given the short time period for GPS observations, the GPS rate may include postseismic motion earlier earthquakes, though these numbers are very close. Based on what we know about strike-slip fault earthquakes, the portions of the fault to the north and south of today’s sequence may have an increased amount of stress due to this earthquake. Stay tuned for a Temblor.net report about this earthquake where I discuss this further. There are reports of a local tsunami with a run-up about 2 meters. However, the UNESCO Sea Level Monitoring Facility (website) does not show any tsunami observations on tide gage data in the region. Most commonly, we associate tsunamigenic earthquakes with subduction zones and thrust faults because these are the types of earthquakes most likely to deform the seafloor, causing the entire water column to be lifted up. Strike-slip earthquakes can generate tsunami if there is sufficient submarine topography that gets offset during the earthquake. Also, if a strike-slip earthquake triggers a landslide, this could cause a tsunami. We will need to wait until people take a deeper look into this before we can make any conclusions about the tsunami and what may have caused it. Did you feel this earthquake? If so, fill out the USGS “Did You Feel It?” form here. If not, why not? Probably because you were too far away. The closer to an earthquake, the more strong the shaking intensity and the larger chance of infrastructure damage (roads, houses, etc.). The USGS PAGER alert for this earthquake shows that there are ~282,000 people living in Palu, a city near the epicenter. The estimate for shaking intensity is a MMI VI, which could result in light damage for resistant structures and moderate damage for vulnerable structures. More about USGS PAGER alerts here. There exists a possibility that there were more than 100 fatalities from this earthquake. There have been tsunami waves recorded on a tide gage over 300 km to the south of the epicenter, at a site called Mumuju. Below is a map and a plot of water surface elevations from this source. I awakened this morning (my time, obviously) to find that there are over 380 reported deaths from this earthquake and tsunami. More on this later in the day (clouds are preparing to our and i need to put some of my stuff under tarps). I prepared a report for Temblor where we present results of static coulomb stress modeling. Here is that report. Here is a (200 MB) video that I edited slightly. Download here. This was originally posted here. I was interviewed by Henry Fountain (NYT) today. Here is the story he wrote. In the upper left corner is a map from Bellier et al. (2016) that shows the plate boundary faults in the region. Relative senses of motion across these faults is shown as red arrows. The M 7.5 epicenter is shown as a blue star (as in other figures). In the lower right corner is a low angle oblique view of the subducting plates in this region (Hall, 2011). Note the orientation of the Sorong fault and the Sulawesi faults. 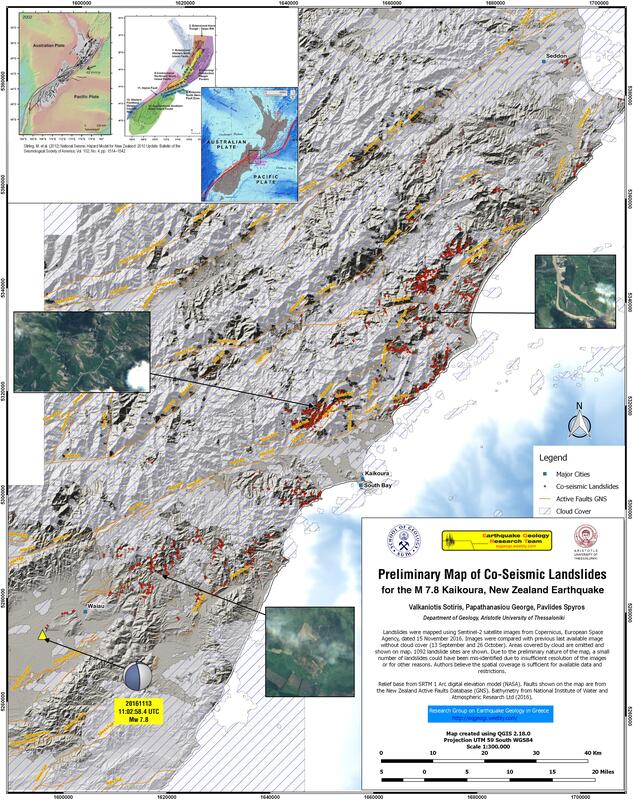 In the lower left corner is a large scale map showing detailed versions of these fault systems in Sulawesi. Earthquake fault mechanisms are plotted for historic earthquakes. 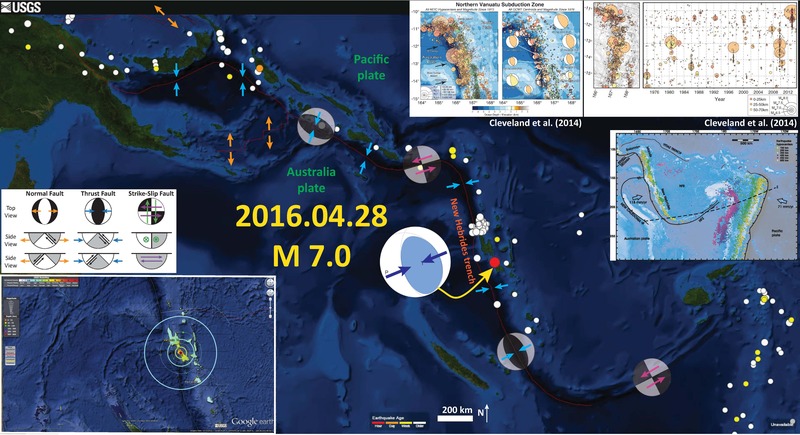 Today’s M 7.5 occurred just to the north of the spatial extent of this map. Here is the map with a centuries worth of seismicity plotted. The official press release from the Meteorology Climatology and Geophysics Council is here. Here is the low angle oblique view of the plate boundaries in this region (Hall., 2011). Here is the map from Bellier et al. (2006) that shows the plate boundary faults, along with some other tectonic information. Regional geodynamic sketch that presents the present day deformation model of Sulawesi area (after Beaudouin et al., 2003) and four main deformation systems around the Central Sulawesi block, highlighting the tectonic complexity of Sulawesi. Approximate location of the Central Sulawesi block rotation pole (P) [compatible with both GPS measurements (Walpersdorf et al., 1998a) and earthquake moment tensor analyses (Beaudouin et al., 2003)], as well as the major active structures are reported. Central Sulawesi Fault System (CSFS) is formed by the Palu–Koro and Matano faults. Arrows correspond to the compression and/or extension directions deduced from both inversion and moment tensor analyses of the focal mechanisms; arrow size being proportional to the deformation rate (e.g., Beaudouin et al., 2003).We also represent the focal mechanism provided by the Harvard CMT database [CMT data base, 2005] for the recent large earthquake (Mw=6.2; 2005/1/23; lat.=0.92° S; long.=120.10° E). The box indicates the approximate location of the Fig. 6 that corresponds to the geological map of the Palu basin region. 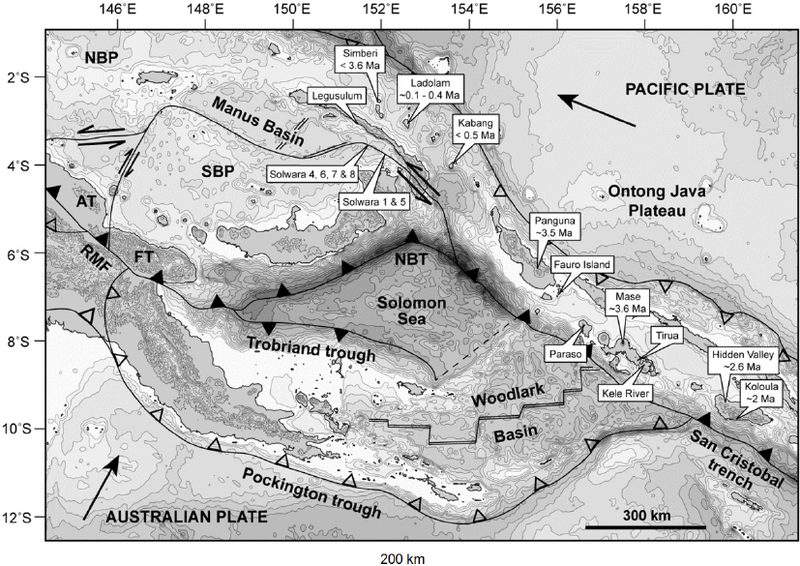 The bottom inset shows the SE Asia and Sulawesi geodynamic frame where arrows represent the approximate Indo-Australian and Philippines plate motions relative to Eurasia. The is the larger scale map showing the general layout of the strike-slip faults in Sulawesi (Bellier et al., 2006). Sketch map of the Cenozoic Central Sulawesi fault system. ML represents the Matano Lake, and Leboni RFZ, the Leboni releasing fault zone that connects the Palu–Koro and Matano Faults. Triangles indicate faults with reverse component (triangles on the upthrown block). On this map are reported the fault kinematic measurement sites. Here is a spectacular photo/sketch pair that demonstrates the excellent geomorphic evidence for this strike-slip fault (Bellier et al., 2006).The stream channels that flow down the alluvial fan in this photo are typical of the features that were used to evaluate the Holocene slip rate. There is a modest amount of vertical motion across this fault in places, causing the formation of basins like the Palu Palu Basin (a graben). The city of Palu is in the center of the Palu Palu Basin. West-looking view of the Palu–Koro fault escarpment SSW of the Palu basin showing faceted spurs and a left-lateral offset of an alluvial fan. At the bottom, sketch of the photograph where white arrows point to the fault trace and black arrows point to the cumulate fan offset along the fault traces. 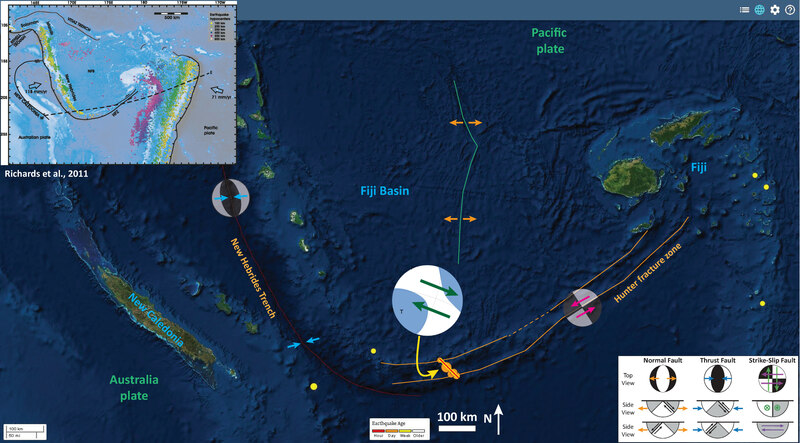 This map shows how Palu is situated relative to this fault system (Bellier et al., 2006). 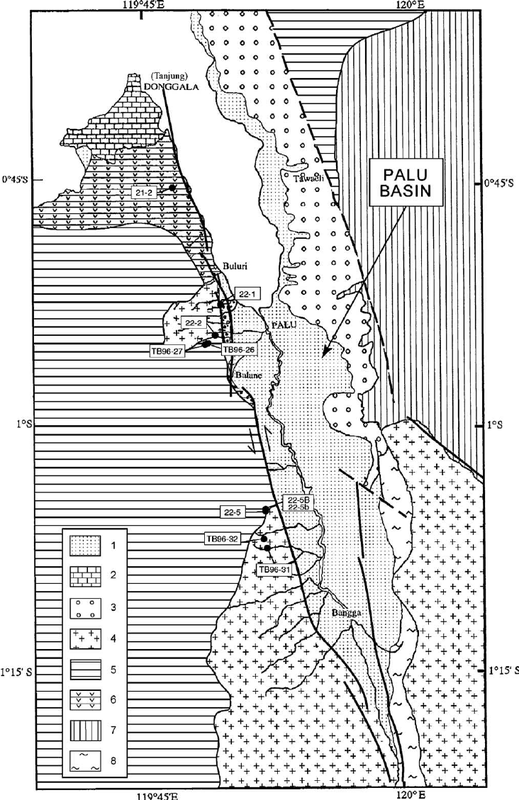 Simplified geological map of the Palu domain (modified after Sukamto, 1973) where are reported the locations of fission-track samples. 1 — Holocene alluvial deposits; 2 — Quaternary coral reef terraces; 3 — Mio-quaternary molasses, 4 — Mio-quaternary granitic rocks and granodiorites, 5 — Middle to Upper Eocene Tinombo Formation metamorphism, 6 — Tinombo Formation magmatism, 7 and 8 — metamorphic bedrock (7 — Cretaceous Latimonjong Formation; 8 — Triassic-Jurassic Gumbasa Formation). Some early GPS analysis was conducted by Waldpersdorf et al. (1998). 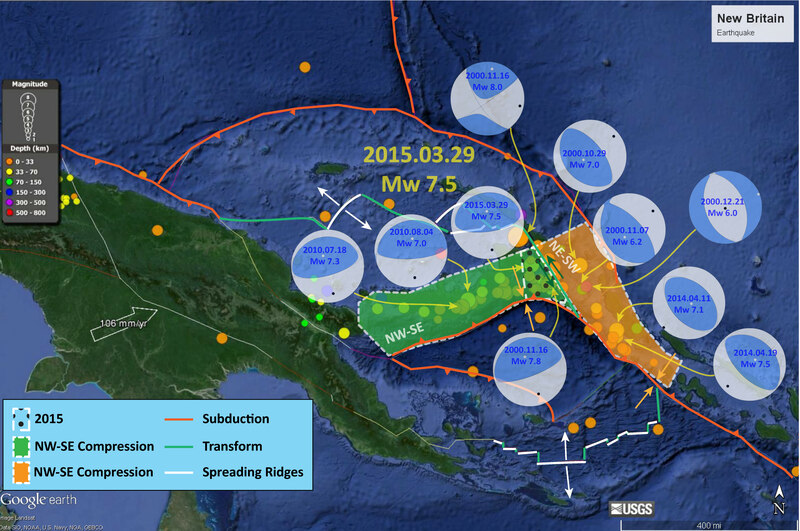 Below is a map showing the location of these GPS observations relative tot he Palu-Koro fault. 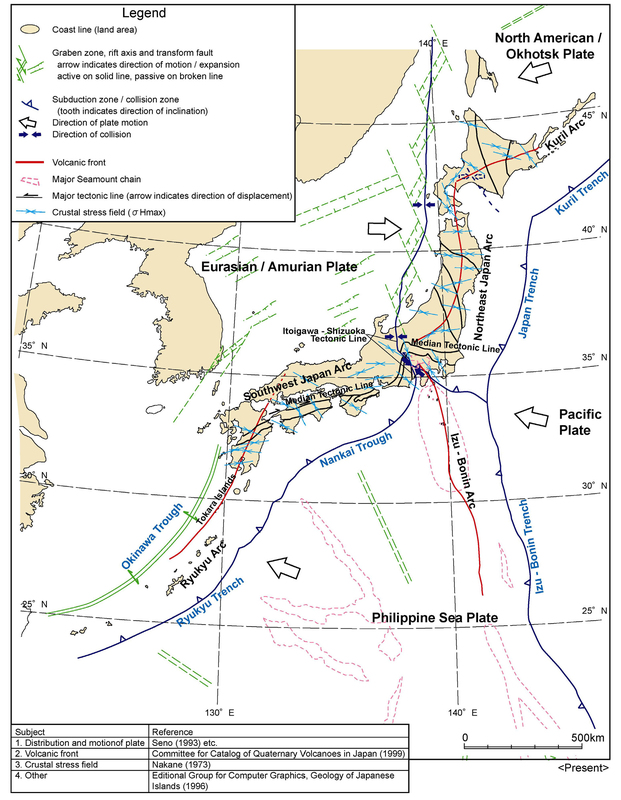 The area of convergence of the Eurasian, Philippine and Australian plate is characterized by the Sula block motion. Active block boundaries are the North Sulawesi trench *(1)., the Palu-Koro (2), and the Matano (3) faults. The Palu transect is indicated buy the box, with a zoom presented in the inset. Furthermore, the two largest earthquakes (CMT) occurring during the observation period are indicated. Here is a map that shows the GPS velocities as vectors in the region of Palu, Indonesia (Waldpersdorf et al., 1998). 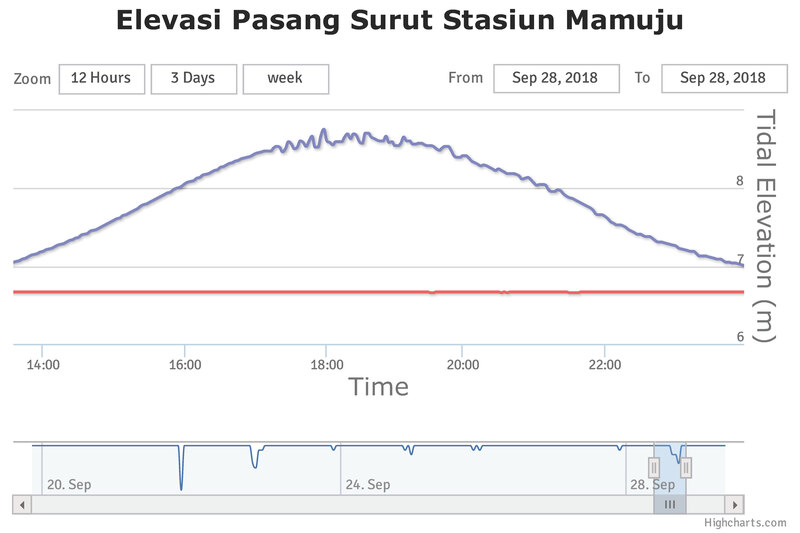 Velocities of the Palu transect stations, with respect to the PALU station. Error ellipses correspond to formal uncertainties of the global solution with a confidence level of 90%. Here are the Waldpersdorf et al. (1998) velocities plotted on a chart. Transect station velocity components parallel to the fault, with the co-seismic deformation due to the Jan. 1996 earthquake removed. They are indicated in function of their distance to the fault. The dark grey line shows best model values (5.5 cm/yr total velocity, 12 km locking depth). Lighter grey lines correspond to locking depths of 8 and 16 km, marking an uncertainty of +-4 km. Below are updated results from GPS and block model analyses from Socquet et al. (2006). Arrows are vectors that represent plate motion velocity in mm/yr (scale in upper right corner). Note how the velocities are different on either side of the Palu-Koro fault. 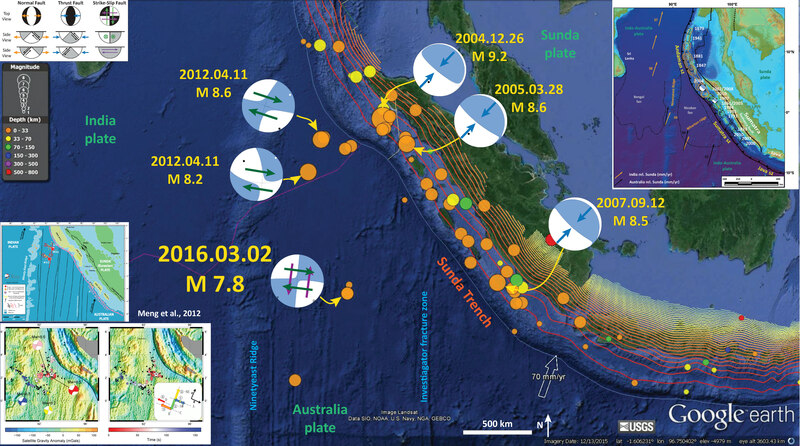 GPS velocities of Sulawesi and surrounding sites with respect to the Sunda Plate. Grey arrows belong to the Makassar Block, black arrows belong to the northern half of Sulawesi, and white arrows belong to non-Sulawesi sites (99% confidence ellipses). Numbers near the tips of the vectors give the rates in mm/yr. The main tectonic structures of the area are shown as well. This map shows models plate motion velocities as informed by their block model. Rotational part of the inferred velocity field in the Sulawesi area (relative to the Sunda Plate) as predicted by the Euler vectors of the best fit model (model 2). Error ellipses of predicted vectors show the 99% level of confidence. Also shown are poles of rotation and error ellipses (with respect to the Sunda Plate) from the best fit model. Curved arrows indicate the sense of rotation, and numbers indicate the rotation rate. MAKA, Makassar Block; MANA, Manado Block; ESUL, East Sula Block; NSUL, North Sula Block. Here is a map that shows the plate boundary slip velocities as color (Socquet et al., 2006). Best fit block model derived from both GPS and earthquakes slip vector azimuth data. Center: Observed (red) and calculated (green) velocities with respect to the Sunda Block (shown are 20% confidence ellipses, after GPS reweighting; see text). The slip rate deficit (mm/yr) for the faults included in the model is represented by a color bar. The profile of Figure 7 is located by the dashed black line. 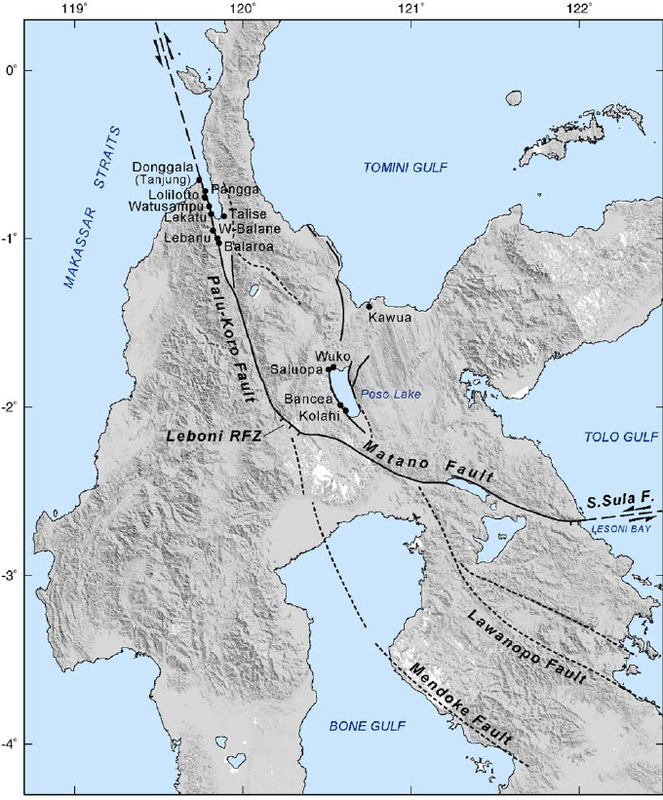 The black rectangles around Palu and Gorontalo faults localize the insets. Top right and bottom left insets show details of the measured and modeled velocities across the Gorontalo and Palu faults. The bottom right inset shows residual GPS velocities with respect to the model. The value of the coupling ratio, j, for the faults included in the model is represented by the color bar. Light blue dots represent the locations of the fault nodes where the coupling ratio is estimated. Nodes along the block boundaries are at the surface of the Earth, and the others are at depth along the fault plane. In this model, j is considered uniform along strike and depth for all the faults, except for Palu Fault and Minahassa Trench, where it is allowed to vary along strike. This plot is similar to the one above, which shows how different GPS observations have different plate motion velocities relative to the faults in the area (Socquet et al., 2006). Velocity profile across Makassar Trench, Palu Fault, and Gorontalo Fault (profile location in Figure 6) in Sunda reference frame. Observed GPS velocities are depicted by dots with 1-sigma uncertainty bars, while the predicted velocities are shown as curves. The profile normal component (approximately NNW) (i.e., the strike-slip component across the NW trending faults) is shown with black dots and solid line, while the profile-parallel component (normal or thrust component across the fault) is shown with grey dots and a dashed line. Where the profile crosses the faults and blocks is labeled. Here are their results plotted on a map (Socquet et al., 2006). (top) GPS velocities in Palu area relative to station WATA. STRM topography is used as background. (bottom) Four parallel elastic dislocations that fit best the velocities in the Palu fault zone. The fault-parallel component of the GPS velocities (with 1-sigma error bars) is plotted with respect to their distance to the main fault scarp, in the North Sula Block reference frame. The black curve represents the fault-parallel modeled velocity of the four strand model. For comparison, the fault-parallel modeled velocity predicted by the single fault model is also plotted (grey dashed curve). The location of the modeled dislocation is represented as vertical bars for each model (black and dashed grey lines, respectively). Here is the fault map from Watkinson and Hall (2017). 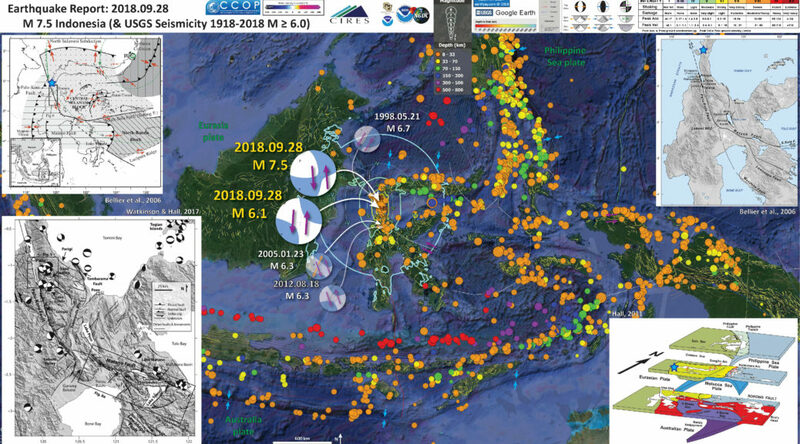 Central Sulawesi overview digital elevation model (SRTM), CMT catalogue earthquakes, 35 km depth and structures that show geomorphic evidence of Quaternary tectonic activity. Rivers marked in white. Illumination from NE. Here is another fantastic view of the geomorphology associated with the Palu-Koro fault (Watkinson and Hall, 2017). The hanging valley is evidence for normal displacement (extension) along this fault. Wine glass canyons are evidence for differential uplift. (a) The Palu and Sapu valleys showing structures that with geomorphic evidence of Quaternary tectonic activity, plus topography and drainage. Mountain front sinuosity values in bold italic text. For location, see Figure 4. Major drainage basins for Salo Sapu and Salo Wuno are marked, separated by uplift at the western end of the Sapu valley fault system. 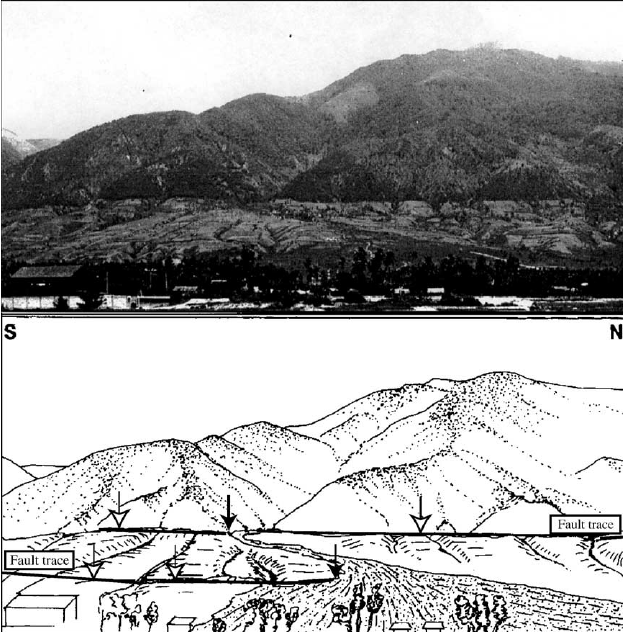 (b) View of the Palu–Koro Fault scarp from the Palu valley, showing geomorphic evidence of Quaternary tectonic activity. In this case, we can see how the river meanders are controlled by the fault. Places where stream offsets were used to measure slip rate are also shown (Watkinson and Hall, 2017). Evidence of a cross-basin fault system within the Palu valley Quaternary fill. (a) Overview ASTER digital elevation model draped with ESRI imagery layer. Illumination from NW. Palu River channels traced from six separate images from 2003 to 2015. Inset shows fault pattern developed in an analogue model of a releasing bend, modified after Wu et al. (2009), reflected and rotated to mimic the Palu valley. Sidewall faults and cross-basin fault system are highlighted in the model and on the satellite imagery. (b, c) Laterally confined meander belts, interpreted as representing minor subsidence within the cross-basin fault system. (d) Laterally confined river channels directly along-strike from a Palu–Koro Fault strand seen to offset alluvial fans in the south of the valley. (c, d, e) showESRI imagery. 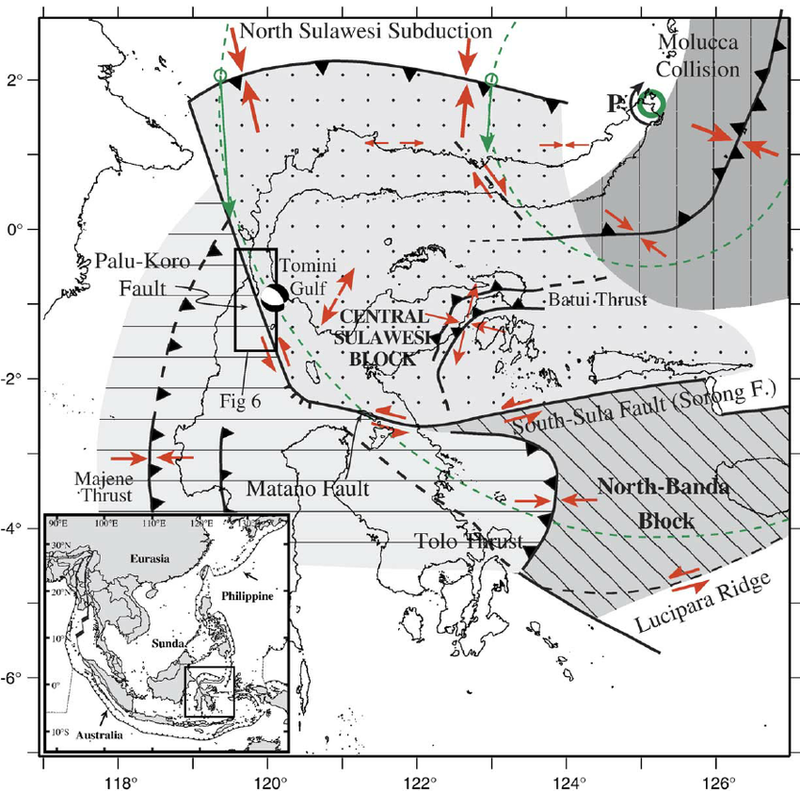 Socquet, A., W. Simons, C. Vigny, R. McCaffrey, C. Subarya, D. Sarsito, B. Ambrosius, and W. Spakman (2006), Microblock rotations and fault coupling in SE Asia triple junction (Sulawesi, Indonesia) from GPS and earthquake slip vector data, J. Geophys. Res., 111, B08409, doi:10.1029/2005JB003963. Back to the Earthquake Reports page. Earthquake of the Day: 2010.02.27 M 8.8 Maule, Chile. There was an earthquake with a magnitude of M 8.8 on this day in 2010. I have prepared an interpretive poster that shows the extent of ground shaking modeled for this earthquake. The attenuation relations (how the ground shaking diminishes with distance from the rutpure) generally match the ground shaking reports on the USGS “Did You Feel It?” web page. 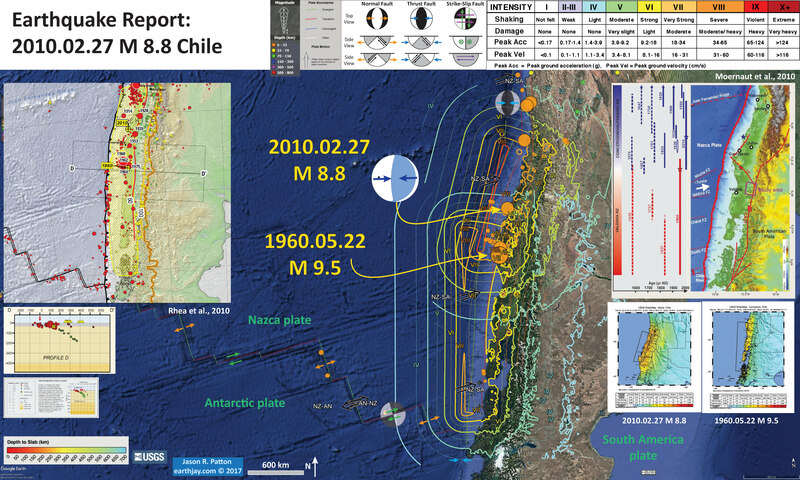 I also include other material on the poster, including information about the 1960 M 9.5 Chile earthquake, which is the largest that we have ever recorded on modern seismologic instruments. Below are the USGS web pages for these two earthquakes. In the upper right corner, I include a time-space diagram from Moernaut et al. (2010). In the upper left corner I include an inset map from the USGS Seismicity History poster for this region (Rhea et al., 2010). There is one seismicity cross section with its locations plotted on the map. The USGS plot these hypocenters along this cross section and I include that below (with the legend). 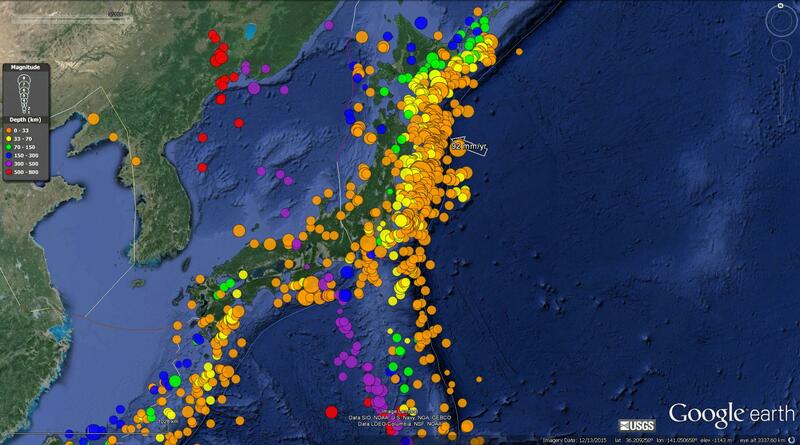 In the lower right corner are the MMI intensity maps for the two earthquakes listed above: 1960 M 9.5 & 2010 M 8.8. Note these are at different map scales. Here is a version that includes the MMI contours for the 1960 earthquake as well. Here is a great figure from Lin et al. 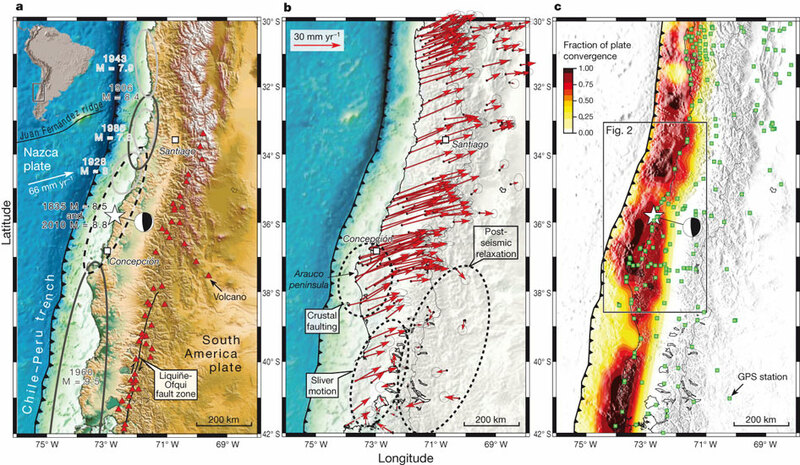 (2013) that shows the tectonic context of the 2010 Maule earthquake. On the map are plotted extents of historic earthquakes along this convergent plate margin. On the right is a large scale map showing the active magmatic arc volcanoes associated with this subduction zone. 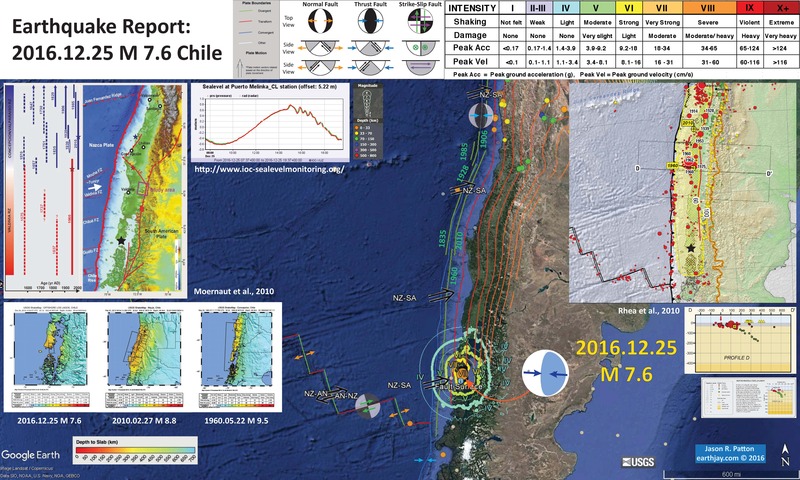 Finally, there is a cross section showing where the coseismic slip and postseismic slip occurred. I include the figure captions as blockquote. Here is a figure from Moreno et al. (2010) that shows the seismogenic locking for the region that includes the 2010 earthquake (shown with a focal mechanism from the M 8.8 earthquake. The figure caption is included below in blockquote. Tectonic setting of the study area, data, observations and results. a, Shaded relief map of the Andean subduction zone in South- Central Chile. Earthquake segmentation along the margin is indicated by ellipses that enclose the approximate rupture areas of historic earthquakes (updated from refs 4–6). The inset shows the location of panel a (rectangle) relative to the South American continent. 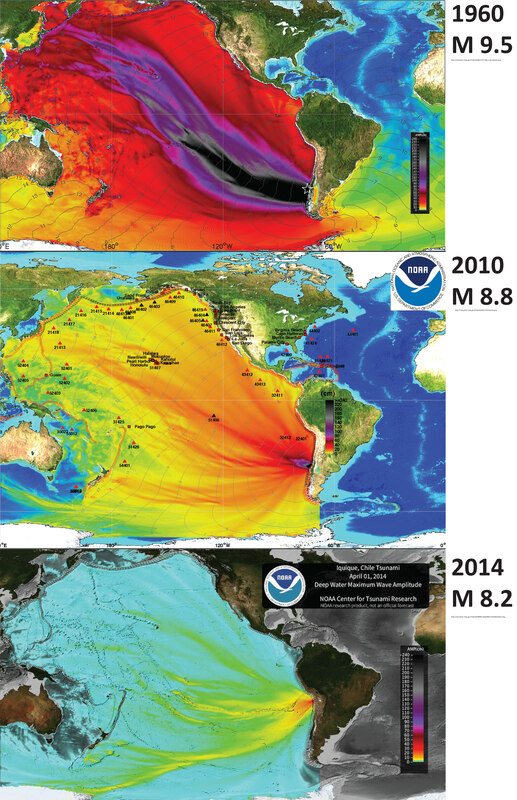 b, Compilation of GPS-observed surface velocities (1996–2008) with respect to stable South America before the 2010 Maule earthquake (for references see online-only Methods). Ellipses attached to the arrows represent 95% confidence limits. 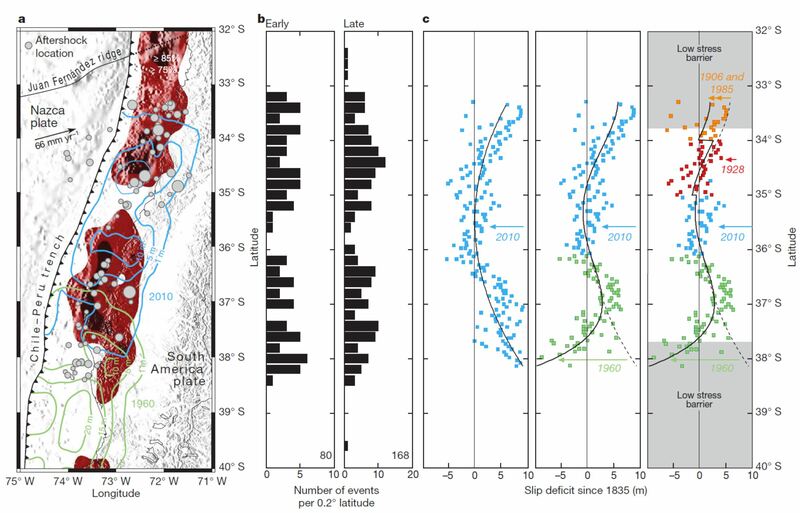 c, GPS 1 FEM modelled interface locking (fraction of plate convergence) distribution along the Andean subduction zone megathrust in the decade before the 2010 Maule earthquake. 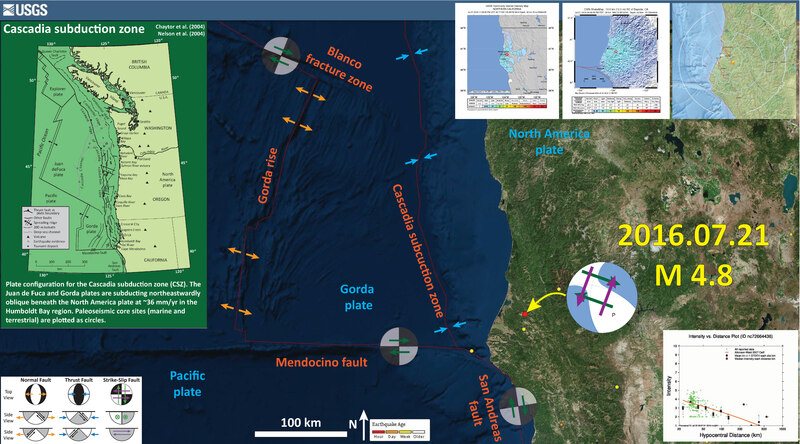 The epicentre (white star, USGS NEIC) and focal mechanism (beach ball, GCMT, http://www.globalcmt.org) of the 2010 Maule earthquake are shown in panels a and c.
This is also from Moreno et al. (2010) and shows the relations between different parts of the earthquake cycle. 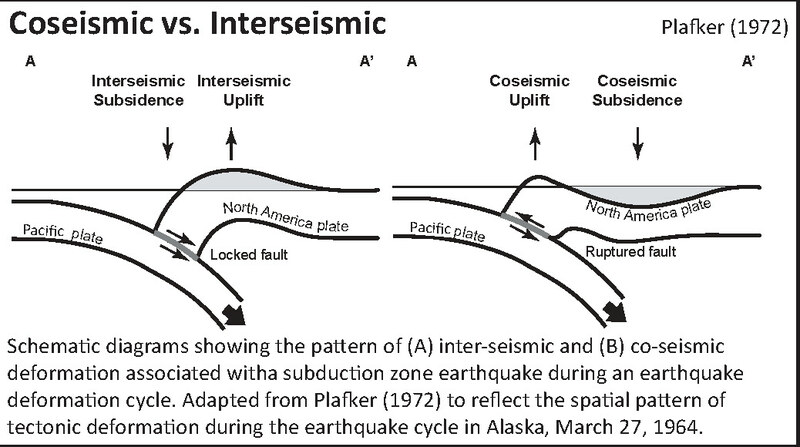 Recall these parts are the interseismic (between earthquakes), coseismic (during the earthquake), preseismic (before the earthquake), and postseismic (after the earthquake). The postseismic phase can last days to decades. Relationship [sic] between pre, co- and postseismic deformation patterns. a, Coseismic slip distribution during the 2010 (blue contours; USGS slip model26) and 1960 (green contours; from ref. 30) earthquakes overlain onto pre-seismic locking pattern (red shading $0.75), as well as early (during the first 48 h post-shock) M$5 aftershock locations (the grey circle sizes scale with magnitude; GEOFON data29). b, Histograms of early (first 48 h; total number of events, 80) and late (first 3 months; total number of events, 168) aftershock density along a north–south profile (GEOFON data29, M$5). c, Residual slip deficits since 1835 as observed after the 2010 earthquake along a north–south profile (left column, based on the USGS slip model26). The middle and right columns show the effects on slip deficit of overlapping twentieth-century earthquakes (the black lines are polynomial fits to the data). Coloured data points and dates indicate earthquakes by year of occurrence. This figure shows the results of analyses from Lin et al. 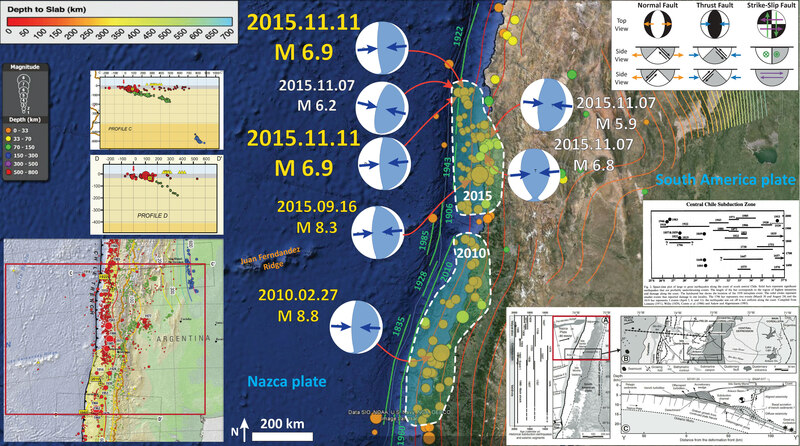 (2013) where they estimate the spatial variation in postseismic slip associated with the 201 M 8.8 Maule earthquake. They used GPS observations along the upper plate to estimate how the fault continued to slip after the main earthquake. Comparison of the postseismic slip model between the 1st and 488th day constrained by (a) horizontal GPS observations only, (b) all three components of GPS observations, and (c) three component GPS observations plus InSAR data. The coseismic slip model is of 2.5 m contour intervals (gray lines). (d) The same afterslip model as Figure 9c. Red dots are aftershocks [Rietbrock et al., 2012]. Black triangles represent the location of GPS stations. A is the afterslip downdip of the coseismic slip patch, with the black arrows indicating the along-strike extent. B and C correspond to two regions of afterslip that bound the southern and northern end of the coseismic slip patch. D is a deep slip patch that may reflect some tropospheric errors in the Andes. Here is the cross section of the subduction zone just to the south of the Sept/Nov 2015 swarm (Melnick et al., 2006). Below I include the text from the Melnick et al. (2006) figure caption as block text. 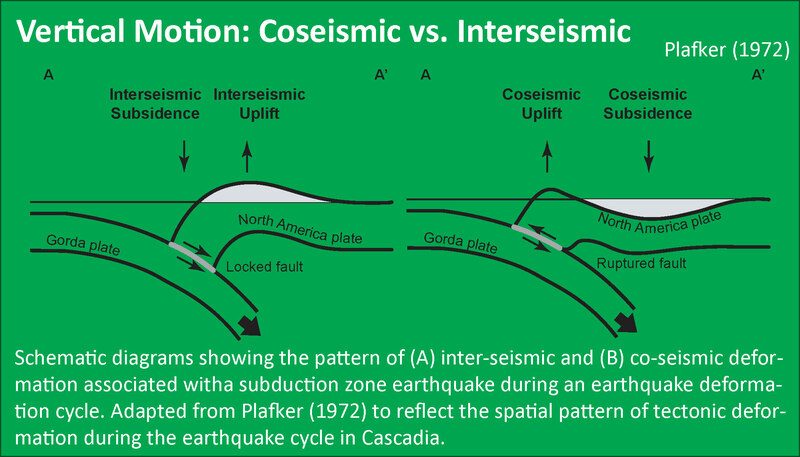 Today (possibly tonight at about 9 PM) is the birthday of the last known Cascadia subduction zone (CSZ) earthquake. 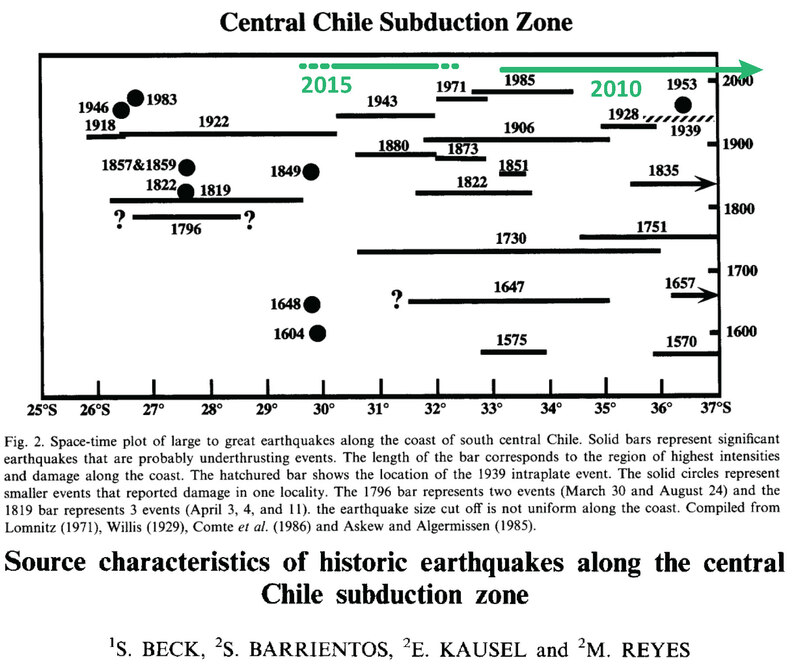 There is some evidence that there have been more recent CSZ earthquakes (e.g. late 19th century in southern OR / northern CA), but they were not near full margin ruptures (where the entire fault, or most of it, slipped during the earthquake). I have been posting material about the CSZ for the past couple of years here and below are some prior Anniversary posts, as well as Earthquake Reports sorted according to their region along the CSZ. Below I present some of the material included in those prior reports (to help bring it all together), but I have prepared a new map for today’s report as well. 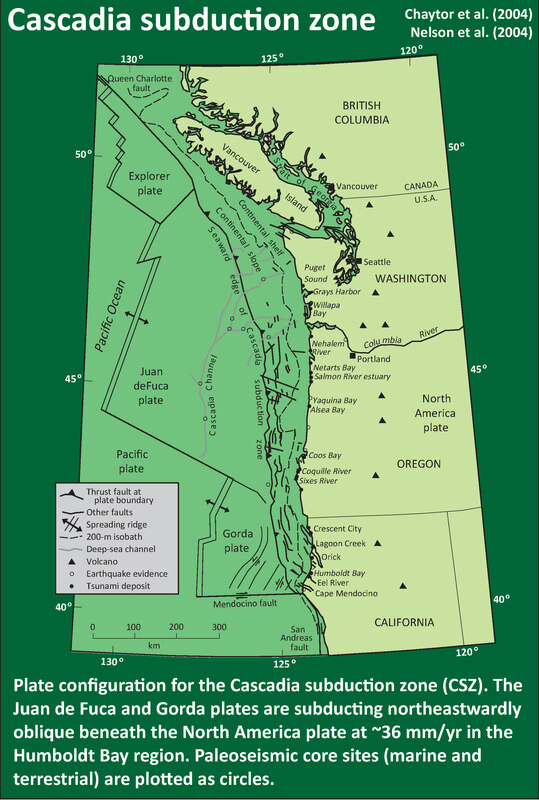 On this evening, 317 years ago, the Cascadia subduction zone fault ruptured as a margin wide earthquake. I here commemorate this birthday with some figures that are in two USGS open source professional papers. The Atwater et al. 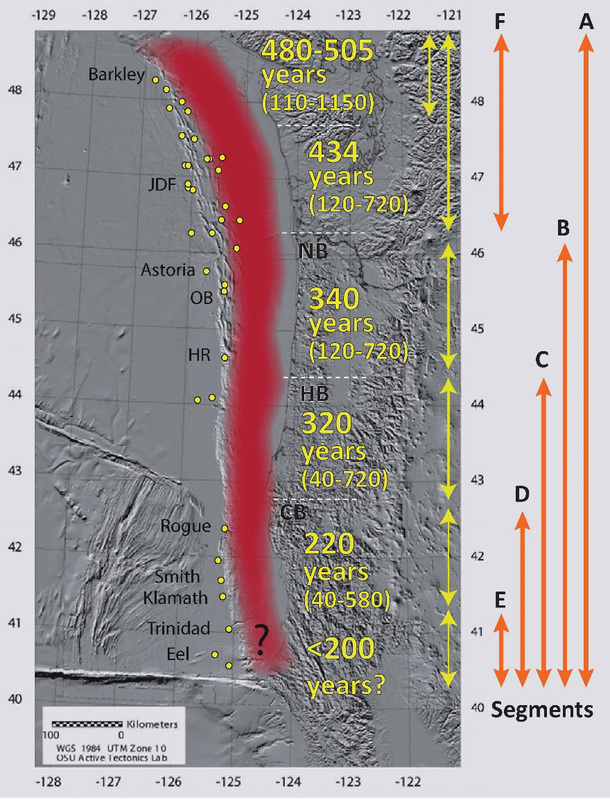 (2005) paper discusses how we came to the conclusion that this last full margin earthquake happened on January 26, 1700 at about 9 PM (there may have been other large magnitude earthquakes in Cascadia in the 19th century). The Goldfinger et al. (2012) paper discusses how we have concluded that the records from terrestrial paleoseismology are correlable and how we think that the margin may have ruptured in the past (rupture patch sizes and timing). The reference list is extensive and this is but a tiny snapshot of what we have learned about Cascadia subduction zone earthquakes. Brian Atwater and his colleagues have updated the Orphan Tsunami and produced a second edition available here for download and here for hard copy purchase (I have a hard copy). Today I prepared this new map showing the results of shakemap scenario model prepared by the USGS. I prepared this map using data that can be downloaded from the USGS website here. Shakemaps show what we think might happen during an earthquake, specifically showing how strongly the ground might shake. There are different measures of this, which include Peak Ground Acceleration (PGA), Peak Ground Velocity (PGV), and Modified Mercalli Intensity (MMI). More background information about the shakemap program at the USGS can be found here. One thing that all of these measures share is that they show that there is a diminishing of ground shaking with distance from the earthquake. This means that the further from the earthquake, the less strongly the shaking will be felt. This can be seen on the maps below. 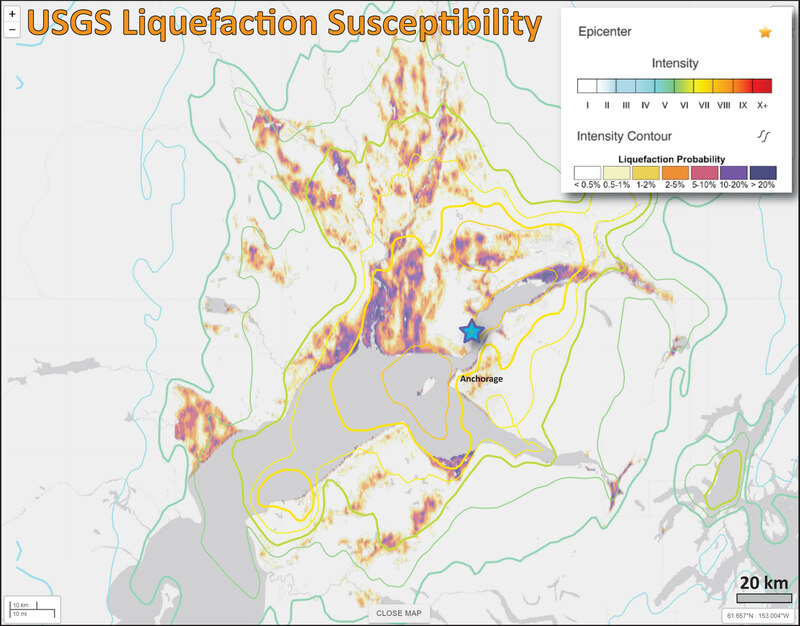 The USGS prepares shakemaps for all earthquakes with sufficiently large magnitudes (i.e. we don’t need shakemaps for earthquakes of magnitude M = 1.5). An archive of these USGS shakemaps can be found here. All the scenario USGS shakemaps can be found here. I chose to use the MMI representation of ground shaking because it is most easily comparable for people to understand. This is because MMI scale is designed based upon relations between ground shaking intensity and observations that people are able to make (e.g. how strongly they felt the earthquake, how much objects in their residences or places of business responded, how much buildings were damaged, etc.). The MMI ground motion model is based upon a computer model estimate of ground motions, different from the “Did You Feel It?” estimate of ground motions that is actually based on real observations. More on the MMI scale can be found here and here. Here is the USGS version of this map. The outline of the fault that was used to generate the ground motions that these maps are based upon is outlined in black. I prepared an end of the year summary for earthquakes along the CSZ. Below is my map from this Earthquake Report. Here is the map where I show the epicenters as circles with colors designating the age. I also plot the USGS moment tensors for each earthquake, with arrows showing the sense of motion for each earthquake. In some cases, I am able to interpret the sense of motion for strike-slip earthquakes. In other cases, I do not know enough to be able to make this interpretation (so I plot both solutions). 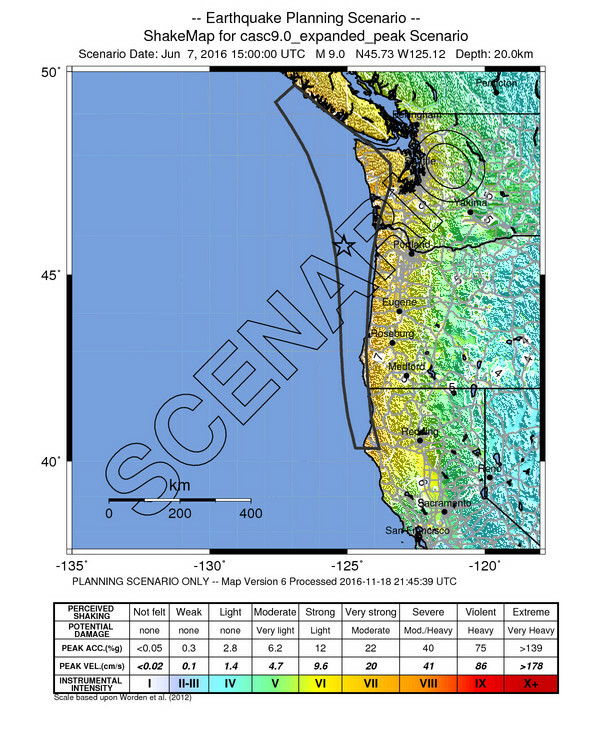 To the lower right of the Cascadia map and cross section is a map showing the latest version of the Uniform California Earthquake Rupture Forecast (UCERF). Let it be known that this is not really a forecast, and this name was poorly chosen. People cannot forecast earthquakes. However, it is still useful. The faults are colored vs. their likelihood of rupturing. More can be found about UCERF here. Note that the San Andreas fault, and her two sister faults (Maacama and Bartlett Springs), are orange-red. 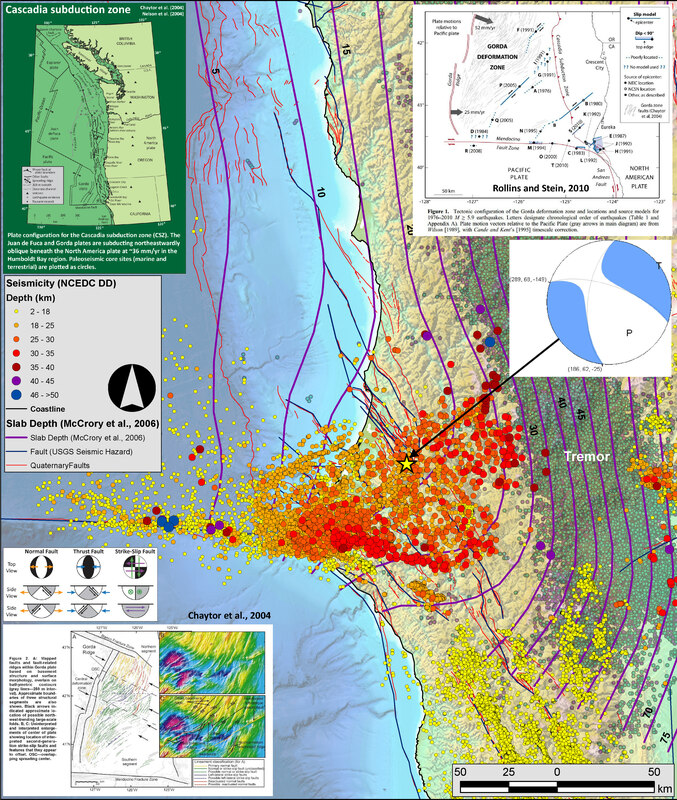 To the upper right of the Cascadia map and cross section is a map showing the shaking intensities based upon the USGS Shakemap model. Earthquake Scenarios describe the expected ground motions and effects of specific hypothetical large earthquakes. The color scale is the same as found on many of my #EarthquakeReport interpretive posters, the Modified Mercalli Intensity Scale (MMI). The latest version of this map is here. In the upper right corner I include generalized fault map of northern California from Wallace (1990). To the left of the Wallace (1990) map is a figure that shows the evolution of the San Andreas fault system since 30 million years ago (Ma). This is a figure from the USGS here. In the lower right corner I include the Earthquake Shaking Potential map from the state of California. This is a probabilistic seismic hazard map, basically a map that shows the likelihood that there will be shaking of a given amount over a period of time. More can be found from the California Geological Survey here. I place a yellow star in the approximate location of today’s earthquake. I have compiled some literature about the CSZ earthquake and tsunami. Here is a short list that might help us learn about what is contained within the core that I collected. Here is a version of the CSZ cross section alone (Plafker, 1972). Below are some links and embedded videos. Here is the yt link for the embedded video below. Just before midnight on January 27, 1700 a tsunami struck the coasts of Japan without warning since no one in Japan felt the earthquake that must have caused it. Nearly 300 years later scientists and historians in Japan and the United States solved the mystery of what caused this “orphan tsunami” through careful analysis of historical records in Japan as well as oral histories of Native Americans, sediment deposits, and ghost forests of drowned trees in the Pacific Northwest of North America, a region also known as Cascadia. 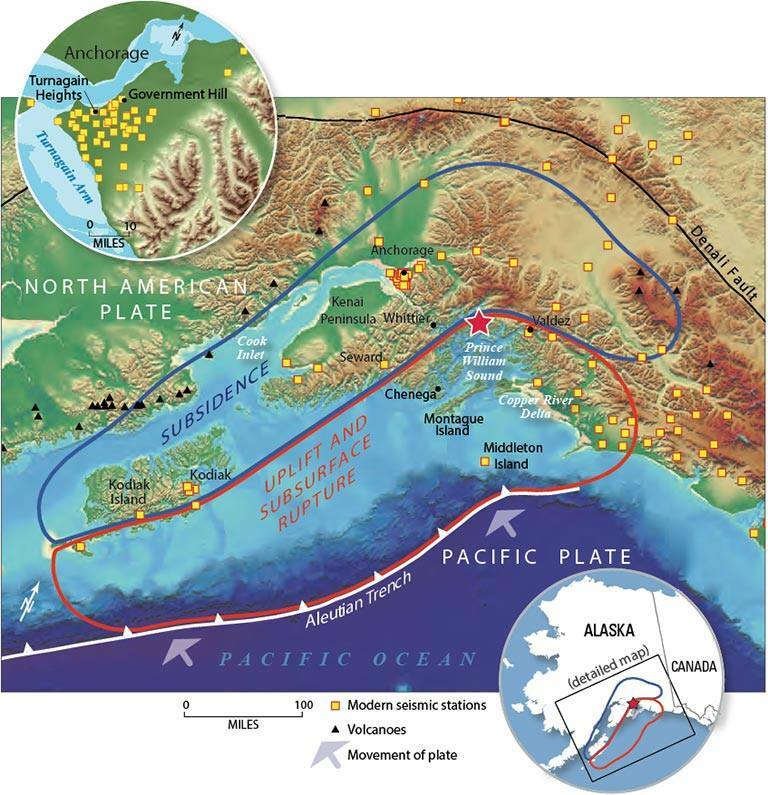 They learned that this geologically active region, the Cascadia Subduction Zone, not only hosts erupting volcanoes but also produces megathrust earthquakes capable of generating devastating, ocean-crossing tsunamis. By comparing the tree rings of dead trees with those still living they could tell when the last of these great earthquakes struck the region. The trees all died in the winter of 1699-1700 when the coasts of northern California, Oregon, and Washington suddenly dropped 1-2 m (3-6 ft.), flooding them with seawater. 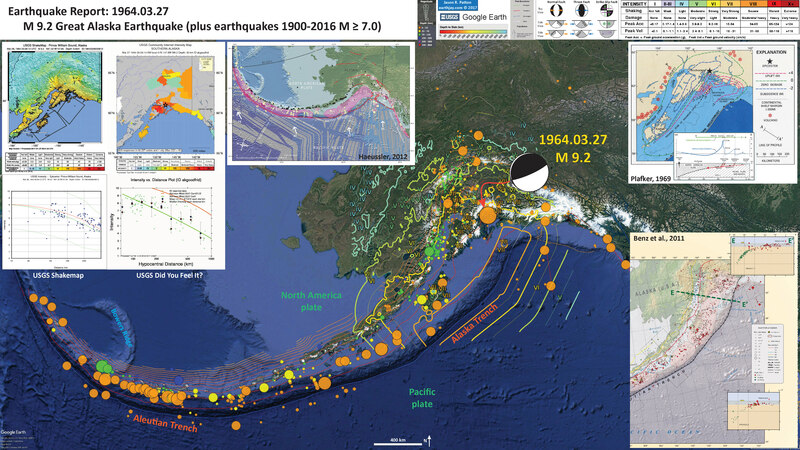 That much motion over such a large area requires a very large earthquake to explain it—perhaps as large as 9.2 magnitude, comparable to the Great Alaska Earthquake of 1964. Such an earthquake would have ruptured the earth along the entire length of the 1000 km (600 mi) -long fault of the Cascadia Subduction Zone and severe shaking could have lasted for 5 minutes or longer. 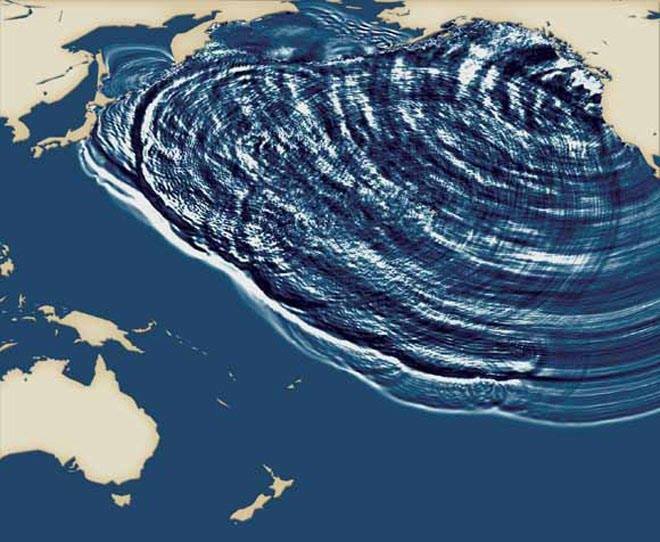 Its tsunami would cross the Pacific Ocean and reach Japan in about 9 hours, so the earthquake must have occurred around 9 o’clock at night in Cascadia on January 26, 1700 (05:00 January 27 UTC). The Pacific Tsunami Warning Center (PTWC) can create an animation of a historical tsunami like this one using the same too that they use for determining tsunami hazard in real time for any tsunami today: the Real-Time Forecasting of Tsunamis (RIFT) forecast model. The RIFT model takes earthquake information as input and calculates how the waves move through the world’s oceans, predicting their speed, wavelength, and amplitude. This animation shows these values through the simulated motion of the waves and as they race around the globe one can also see the distance between successive wave crests (wavelength) as well as their height (half-amplitude) indicated by their color. More importantly, the model also shows what happens when these tsunami waves strike land, the very information that PTWC needs to issue tsunami hazard guidance for impacted coastlines. From the beginning the animation shows all coastlines covered by colored points. These are initially a blue color like the undisturbed ocean to indicate normal sea level, but as the tsunami waves reach them they will change color to represent the height of the waves coming ashore, and often these values are higher than they were in the deeper waters offshore. The color scheme is based on PTWC’s warning criteria, with blue-to-green representing no hazard (less than 30 cm or ~1 ft.), yellow-to-orange indicating low hazard with a stay-off-the-beach recommendation (30 to 100 cm or ~1 to 3 ft.), light red-to-bright red indicating significant hazard requiring evacuation (1 to 3 m or ~3 to 10 ft.), and dark red indicating a severe hazard possibly requiring a second-tier evacuation (greater than 3 m or ~10 ft.). Toward the end of this simulated 24-hours of activity the wave animation will transition to the “energy map” of a mathematical surface representing the maximum rise in sea-level on the open ocean caused by the tsunami, a pattern that indicates that the kinetic energy of the tsunami was not distributed evenly across the oceans but instead forms a highly directional “beam” such that the tsunami was far more severe in the middle of the “beam” of energy than on its sides. This pattern also generally correlates to the coastal impacts; note how those coastlines directly in the “beam” have a much higher impact than those to either side of it. Here is an example of how these “seismoturbidites” have been correlated. The correlations are the basis for the interpretation that these submarine landslides were triggered by Cascadia subduction zone earthquakes. This correlation figure demonstrates how well these turbidites have been correlated. Goldfinger et al., 2012. Here is an update of this plot given new correlations from recent work (Goldfinger et al., 2016). Here is a plot showing the earthquakes in a linear timescale. I combined the plot above into another figure that includes all the recurrence intervals and segment lengths in a single figure. This is modified from Goldfinger et al. (2012). Patton, J. R., Goldfinger, C., Morey, A. E., Romsos, C., Black, B., Djadjadihardja, Y., and Udrekh, 2013. 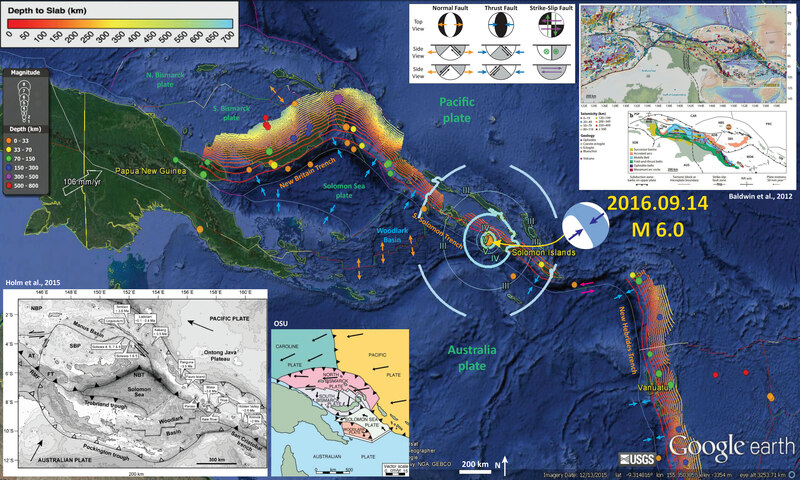 Seismoturbidite record as preserved at core sites at the Cascadia and Sumatra–Andaman subduction zones, Nat. Hazards Earth Syst. Sci., 13, 833-867, doi:10.5194/nhess-13-833-2013, 2013. 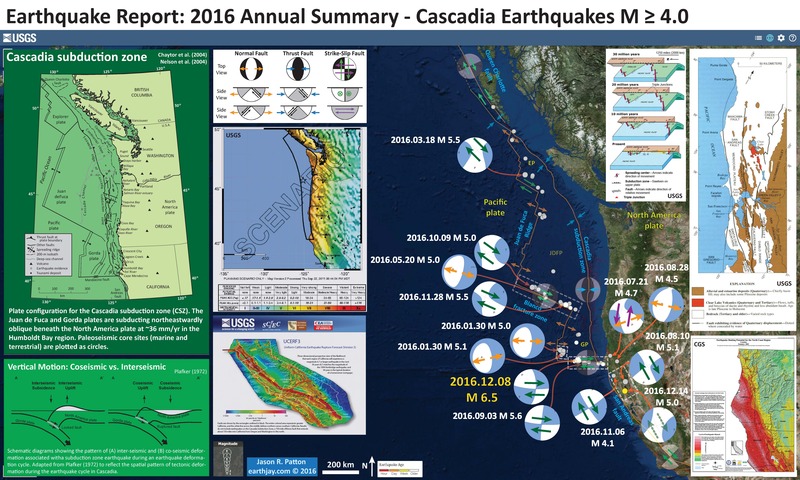 Here I summarize the seismicity for Cascadia in 2016. I limit this summary to earthquakes with magnitude greater than or equal to M 4.0. I reported on all but two of these earthquakes. I put this together a couple weeks ago, but wanted to wait to post until the new year (just in case that there was another earthquake to include). I prepared a 2016 annual summary for Earth here. I include summaries of my earthquake reports in sorted into three categories. One may also search for earthquakes that may not have made it into these summary pages (use the search tool). The big player this year was an M 6.5 along the Mendocino fault on 2016.12.08. Here I present an inventory of 8 earthquakes with M ≥ 5.0. There are a few additional earthquakes with smaller magnitudes that are of particular interest. Please visit the #EarthquakeReport pages for more information about the figures that I include in the Earthquake Report interpretive posters below. Here are the web pages for these earthquakes. The first link goes to the USGS page and the second link goes to the Earthquake Report page. 2016.01.30 M 5.1 Gorda Rise (USGS). 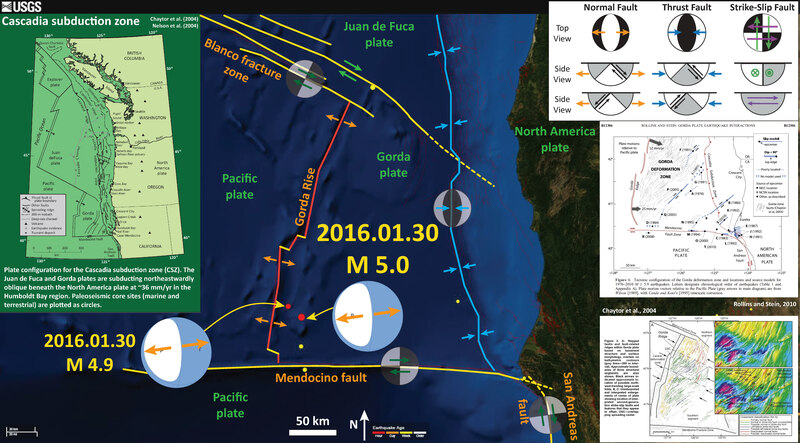 2016.01.30 M 5.0 Gorda Rise (USGS) and my Earthquake Report. The below map includes both the M 5.1 and M 5.0 earthquakes listed above, though on my poster they are labeled M 4.9 and M 5.0 respectively. 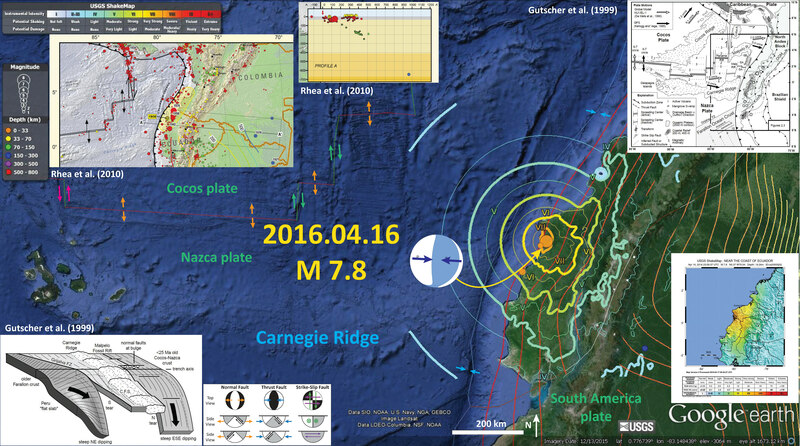 2016.03.18 M 5.2 Explorer plate (USGS) and my Earthquake Report. 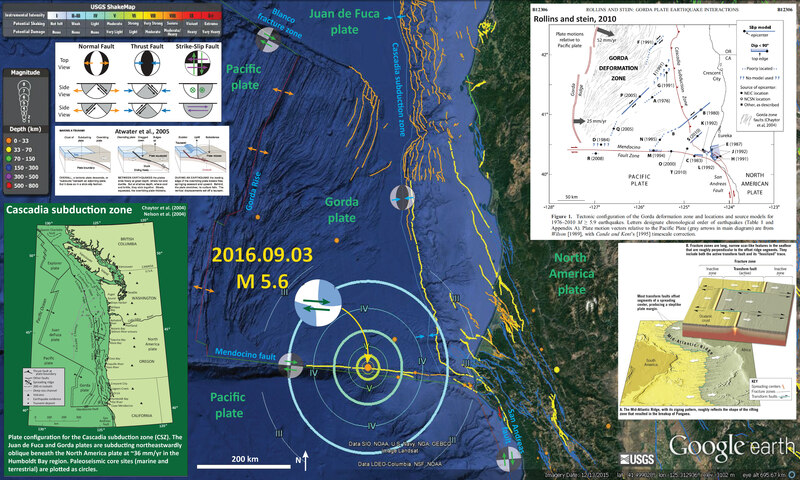 2016.05.20 M 5.0 Blanco fracture zone (USGS). 2016.07.21 M 4.7 Bayside, California (USGS) and my first Earthquake Report and Update #1. The second map below has lots of additional material plotted that is explained on the Update #1 page. 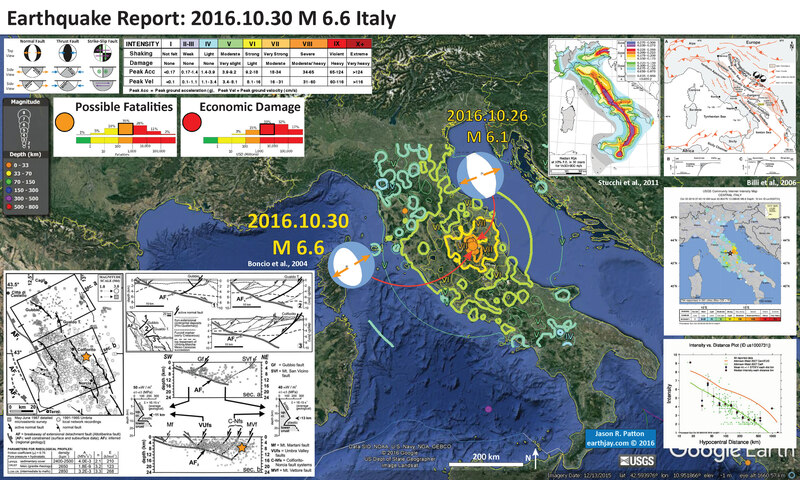 2016.08.10 M 5.1 Upper Lake (USGS) and my Earthquake Report. 2016.08.28 M 4.5 Hayfork, California (USGS). 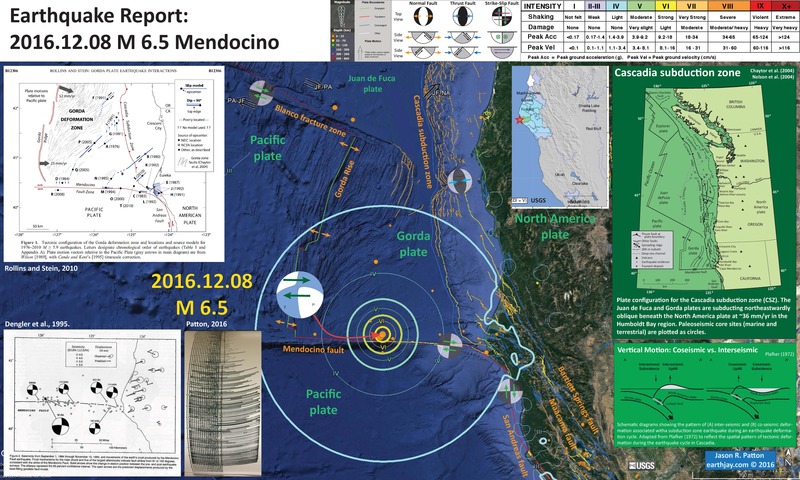 2016.09.03 M 5.6 Mendocino fault (USGS) and my Earthquake Report. 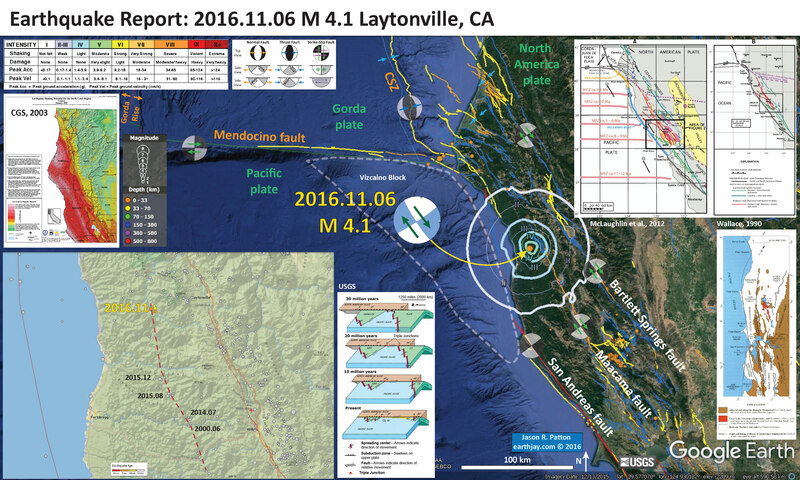 2016.11.06 M 4.1 Laytonville, California (USGS) and my Earthquake Report. 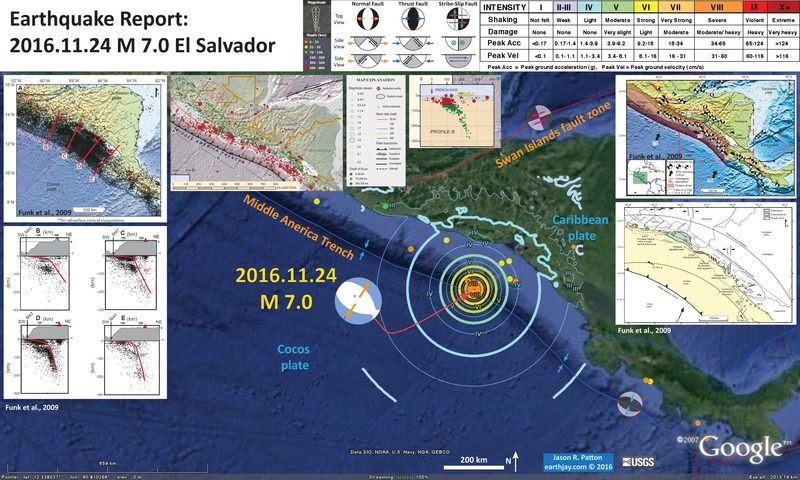 2016.11.28 M 5.5 Blanco fracture zone (USGS). 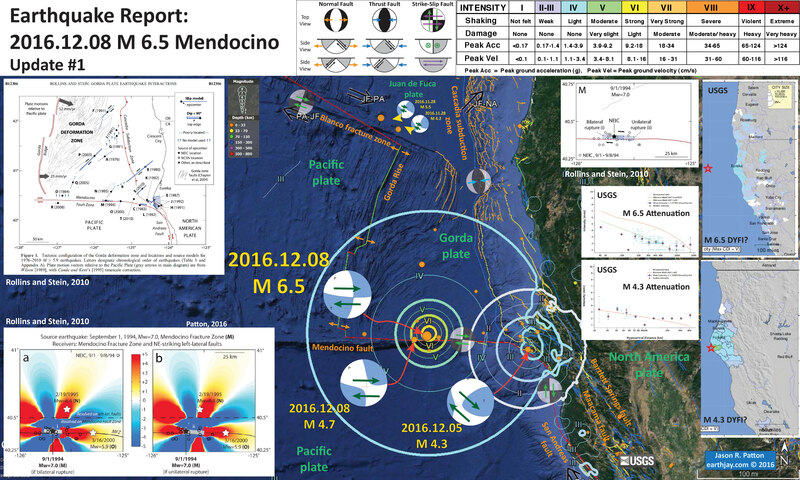 2016.12.08 M 6.5 Mendocino fault (USGS) and my Earthquake Report and my Update #1. The upper figure is my initial #EarthquakeReport interpretive poster and the lower figure is my updated poster. 2016.12.14 M 5.0 The Geysers, California (USGS). 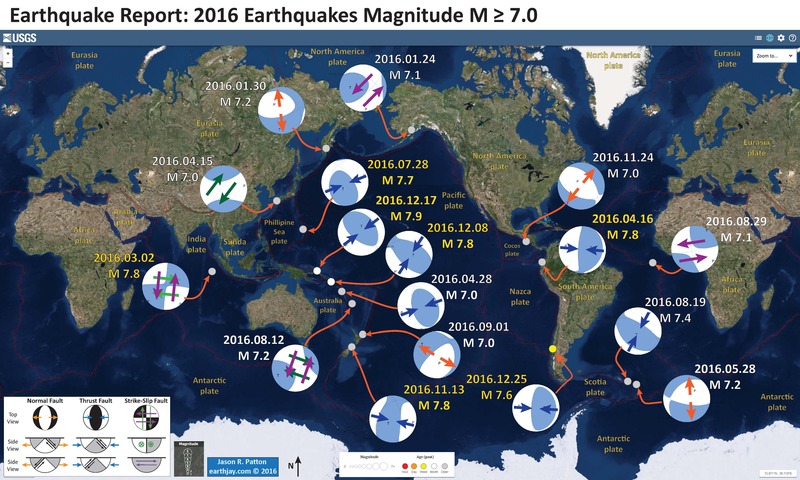 Here I summarize the global seismicity for 2016. 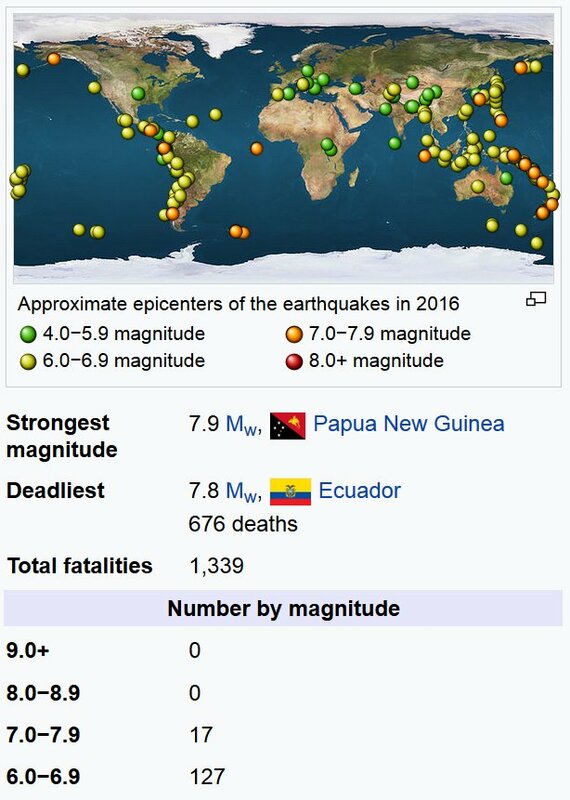 I limit this summary to earthquakes with magnitude greater than or equal to M 7.0. I reported on all but two of these earthquakes. There were no earthquakes as large as an M 8.0 for the entire year of 2016. However, we had an inventory of 17 earthquakes with M ≥ 7.0. Here is the 2015 Earthquake Summary Page. I initially prepared this a couple weeks ago, but wanted to wait until January 1 before I presented it. 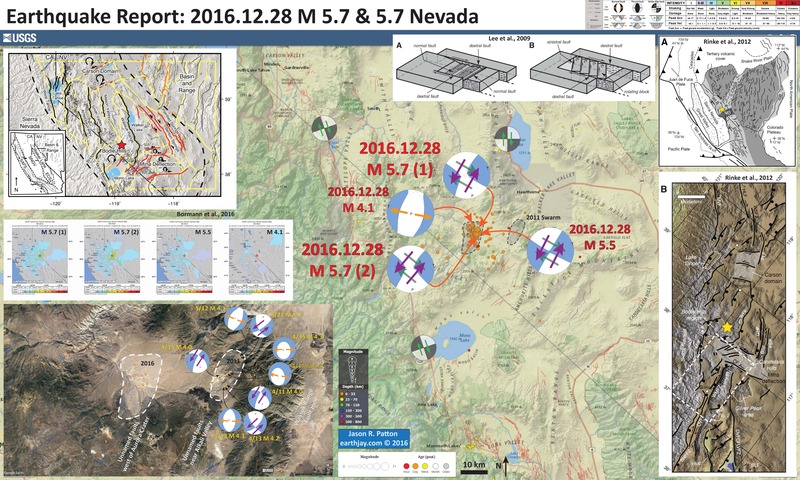 Good thing I waited as there was an earthquake in Chile on 12/25 and a swarm in Nevada on 12/28. Happy New Year! Waiting to post this was challenging, sort of like waiting to open wrapped holiday gifts. I prepared a 2016 annual summary for the Cascadia region here. Compare with last year’s summary poster. Here is the 2015 Earthquake Summary Page. 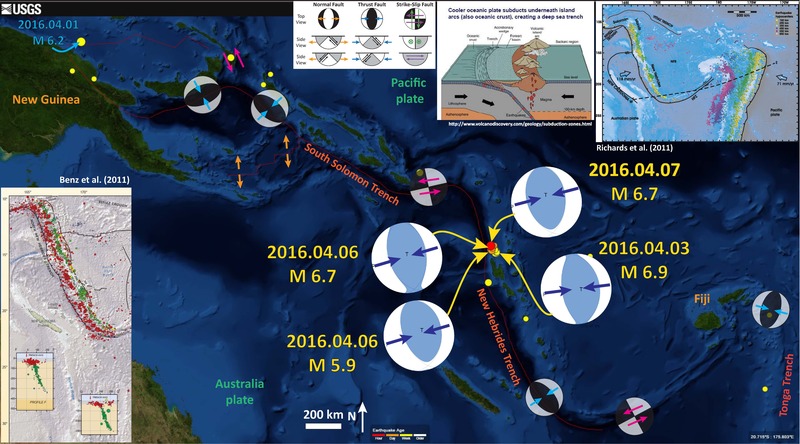 Note how the subduction zones in the southwestern Pacific are highly active in both 2015 and 2016. Here is a summary showing a running total and mean of earthquakes for different magnitude ranges. This came from Chris Rowan @Allochthonous. Here is a summary showing the epicenters from earthquakes in 2016 with symbol sorted vs. magnitude. This came from Susan Hough @SeismoSue. 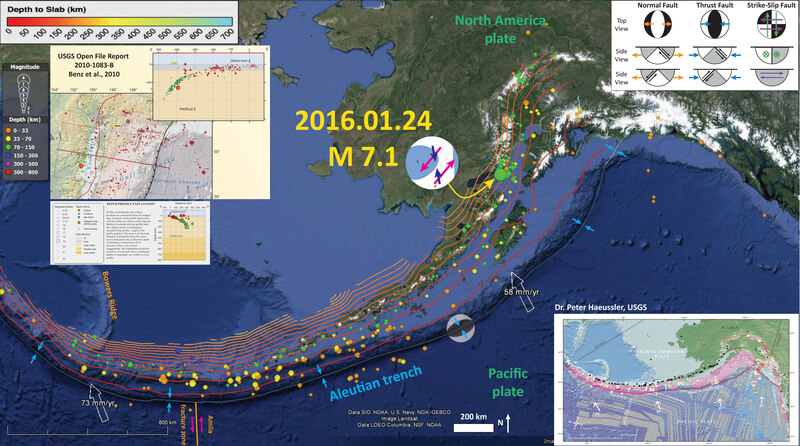 2016.01.24 M 7.1 Alaska, USA (USGS) and my #EarthquakeReport. 2016.01.30 M 7.2 Kamchatka Peninsula, Russia (USGS) and my #EarthquakeReport. 2016.03.02 M 7.8 Sumatra, Indonesia (USGS) and my #EarthquakeReport. 2016.04.15 M 7.0 Kumamoto, Japan (USGS) and my #EarthquakeReport and update. I put together an animation for the seismicity from the past few days. The animation spans 4/13-4/16. Below is a map that shows a summary of the animation. Beneath that is the video (link and embedded). 2016.04.16 M 7.8 Quito, Ecuador (USGS) and my #EarthquakeReport and update. 2016.04.28 M 7.0 Vanuatu (USGS) and my #EarthquakeReport. 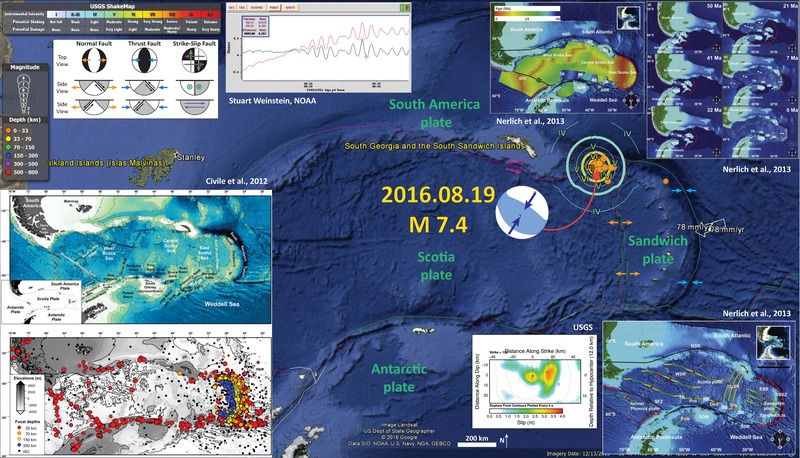 2016.05.28 M 7.2 South Sandwich Islands (USGS). 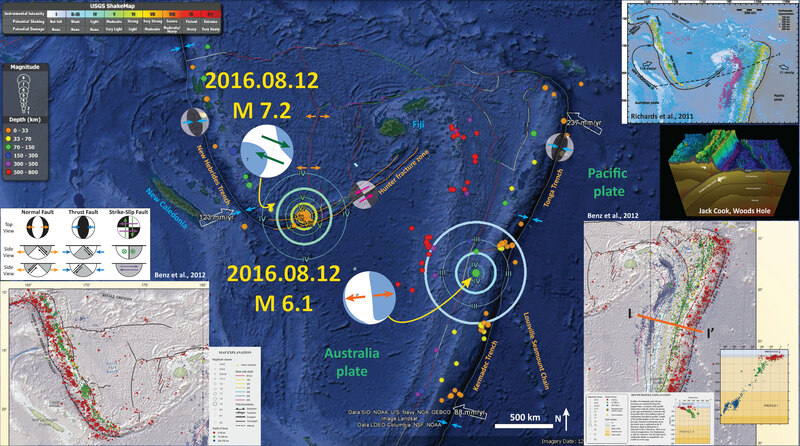 2016.08.12 M 7.2 New Hebrides (USGS) and my Earthquake Report and update #1 and update #2. 2016.08.19 M 7.4 South Sandwich Islands (USGS) and my #EarthquakeReport. 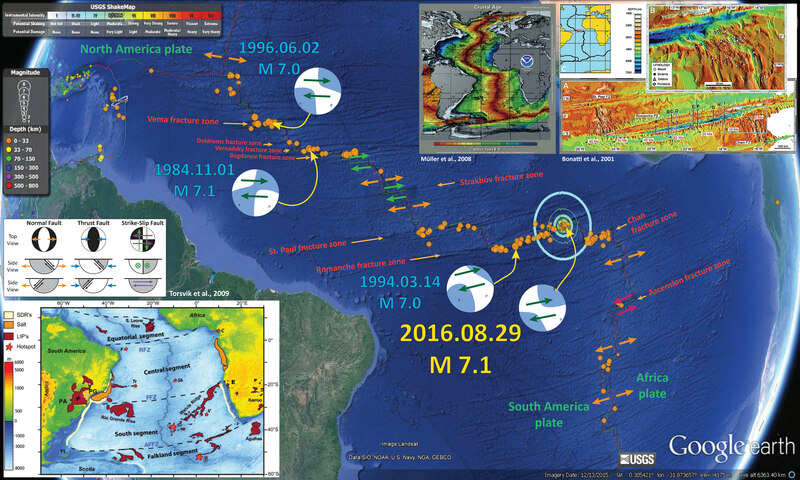 2016.08.29 M 7.1 Mid Atlantic Ridge (USGS) and my #EarthquakeReport. 2016.09.01 M 7.0 Gisborne, New Zealand (USGS) and my #EarthquakeReport. 2016.11.13 M 7.8 Kaikoura, New Zealand (USGS) and my #EarthquakeReport and update #2. 2016.11.24 M 7.0 El Salvador (USGS) and my #EarthquakeReport. 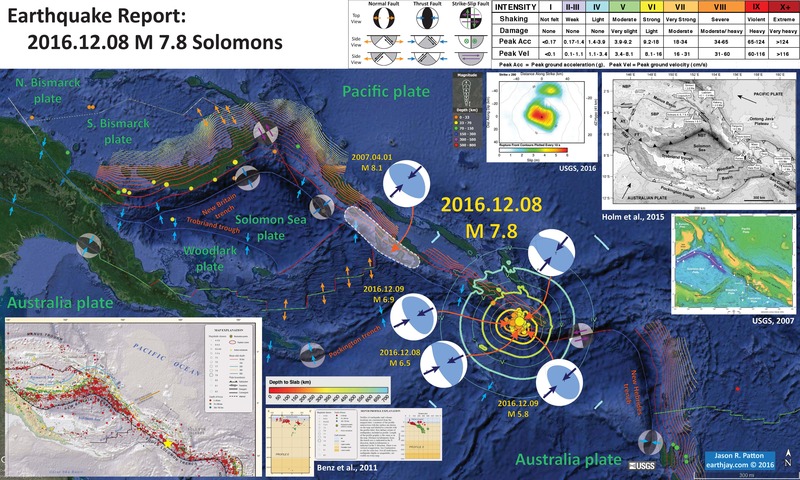 2016.12.08 M 7.8 Solomon Islands (USGS) and my #EarthquakeReport. 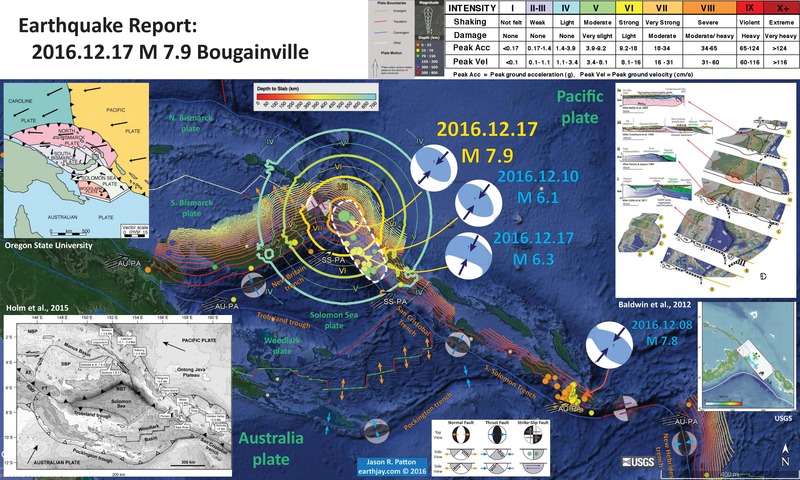 2016.12.17 M 7.9 Bougainville (USGS) and my #EarthquakeReport. 2016.12.25 M 7.6 Chile (USGS) and my #EarthquakeReport. Here are web pages for some additional earthquakes. The USGS web page for each of these earthquakes is available on the Earthquake Report Page. 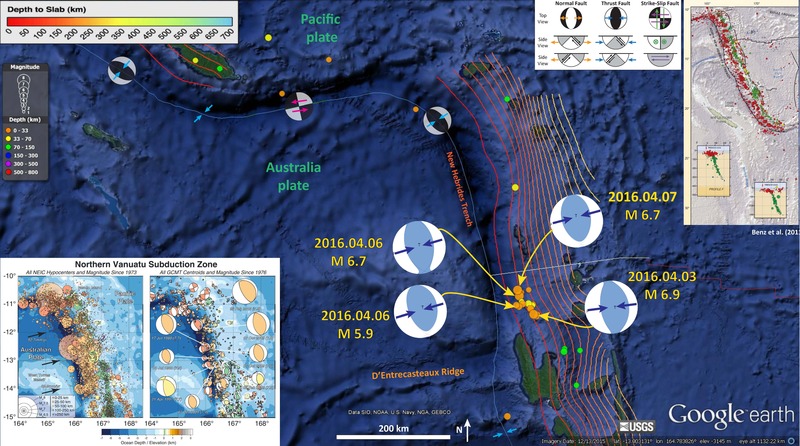 Yesterday there began a swarm of seismic activity along the southern Solomon trench. What began with a M 7.8 earthquake on 2016.12.08, there have been many aftershocks including a M 6.9 this morning (my time). I plot the seismicity from the past month, with color representing depth and diameter representing magnitude (see legend). I also plot the moment tensor and rupture slip patch for the 2007.04.01 M 8.1 subduction zone tsunamigenic earthquake. I include the slab contours plotted (Hayes et al., 2012), which are contours that represent the depth to the subduction zone fault. These are mostly based upon seismicity. The depths of the earthquakes have considerable error and do not all occur along the subduction zone faults, so these slab contours are simply the best estimate for the location of the fault. The hypocentral depth plots this close to the location of the fault as mapped by Hayes et al. (2012). 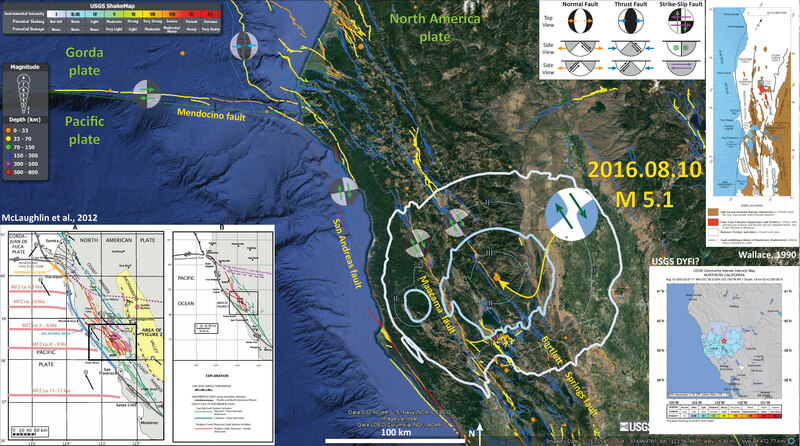 So, the earthquake is either in the downgoing slab, or in the upper plate and a result of the seismogenic locked plate transferring the shear strain from a fracture zone in the downgoing plate to the upper plate. Here are the USGS web pages for the larger magnitude earthquakes. In the upper right corner is a generalized tectonic map of the region from Holm et al., 2015. This map shows the major plate boundary faults including the New Britain trench (NBT), one of the main culprits for recent seismicity of this region. To the left of this map is the USGS fault plane solution. This figure shows their model results with color representing the spatial variation in earthquake fault slip for this M 7.8 earthquake. This model is calibrated using seismologic observations. The MMI contours reflect the rectangular fault plane used in their model. Smaller earthquake are modeled using a point source (imagine an hypocenter as a source instead of a rectangular fault slip source). These point source MMI contours are generally more circular looking (except where they intersect topography or regions with bedrock that might amplify seismic waves). Below the Holm et al. 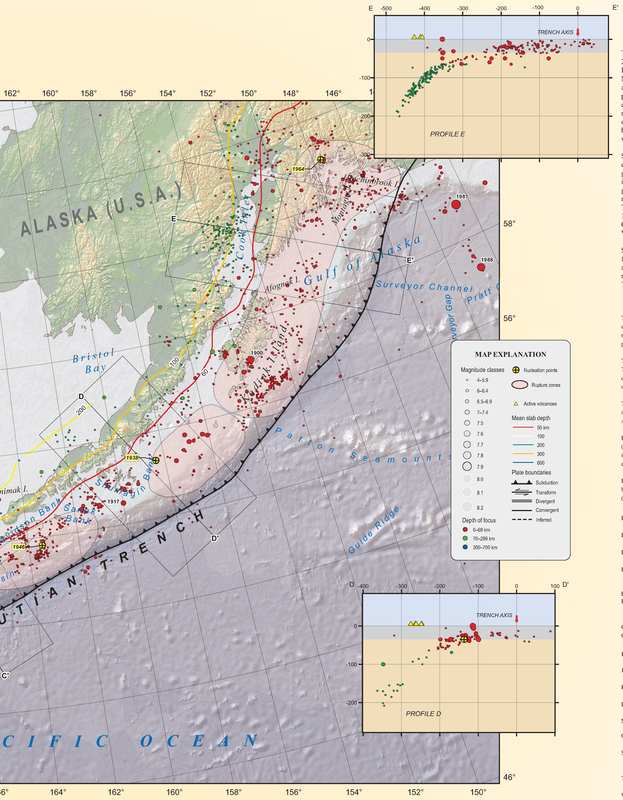 (2015) map is a map that shows the region of this subduction zone that ruptured in 2007 (USGS, 2007). This M 8.1 earthquake caused a damaging tsunami. Here is the USGS website for this earthquake. In the lower left corner is another generalized tectonic map of the region from Benz et al., 201. 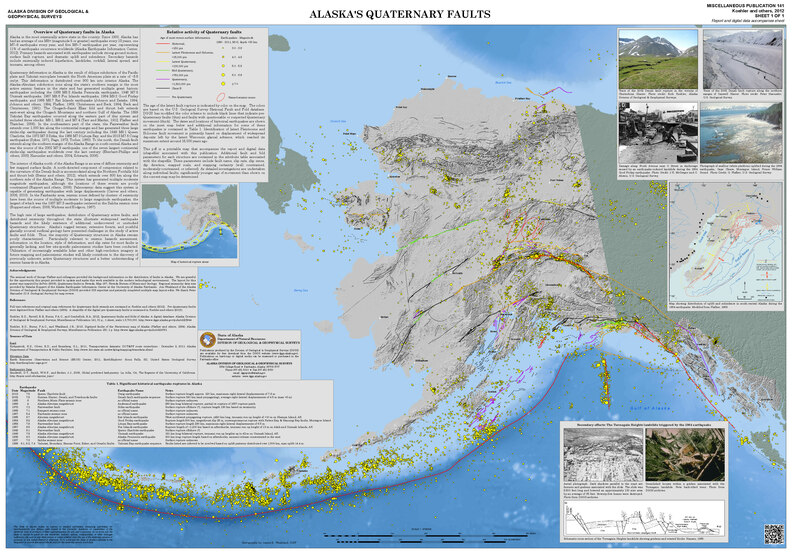 This map shows historic seismicity for this region. Earthquake epicenters are colored to represent depth and sized to represent magnitude. There is a yellow star located approximately in the location of today’s M 7.8. This earthquake has a similar down-dip distance as the 2007.04.01 M 8.1 earthquake (the large red dot labeled 2007 near the intersection of the Woodlark Spreading Center and the South Solomon Trench). The 2007 earthquake generated a large damaging tsunami. I include the cross section that shows hypocentral depths for earthquakes in the region between the 2007 April and 2016 December earthquakes. This is an image of the HSU Baby Benioff seismograph showing the M 7.8 earthquake. 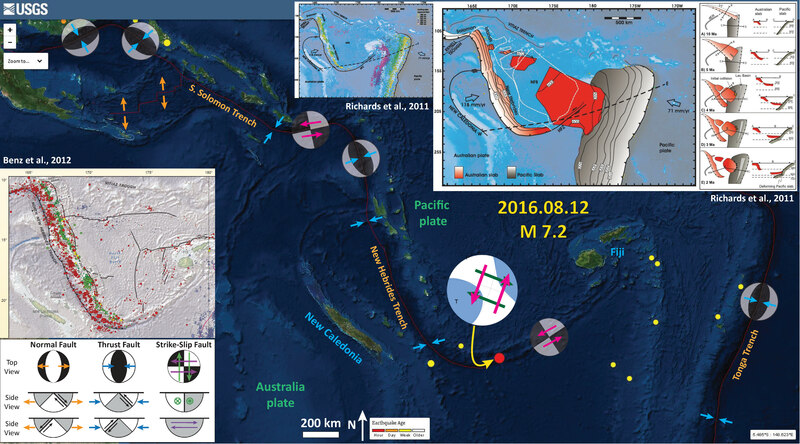 This swarm of earthquake may be the result of a a static coulomb stress change along the subduction fault as imparted by the strike-slip earthquakes from mid-May of 2015. There is a transform plate boundary connecting the southern South Solomon Trench with the northern New Hebrides Trench. There were three earthquakes with upper M 6 magnitudes. These were left lateral strike slip faults that may have increased the stress along the subduction zone faults to the east and west of these earthquakes. This current swarm of earthquakes may be in the region of increased stress, but I have not modeled this myself (too much other stuff to do right now). There is no way to know what the state of stress along these subduction zone faults was prior to the May 2007 earthquakes, but for there to be static triggering like this, the fault would need to be at a high state of stress. Here is a map that I put together. I plot the epicenters of the earthquakes, along with the moment tensors for the three largest magnitude earthquakes. I also place a transparent focal mechanism over the swarm, showing the sense of motion for this plate boundary fault. More is presented in my Earthquake Report for this May 2007 series. I also note that these three largest earthquakes happen in a time order from east to west, unzipping the fault over three +- days. I label them in order (1, 2, 3) and place an orange arrow depicting this temporal relation). Very cool! 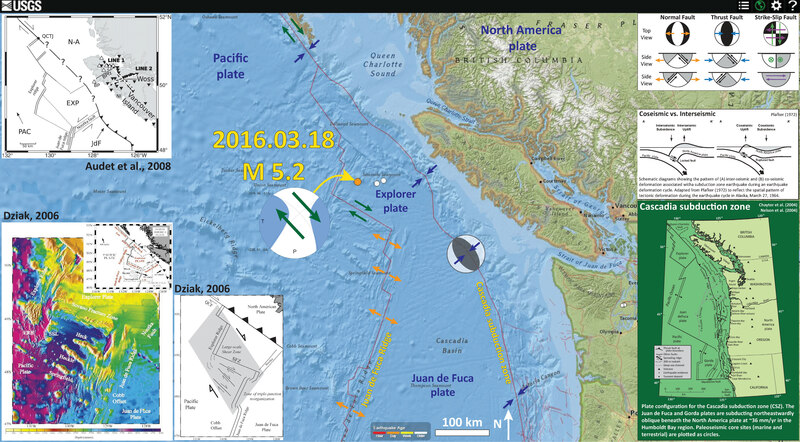 In addition, there was a subduction zone earthquake to the north of the current swarm. There was a M 6.0 in 2016.09.14. Here is my report for that earthquake. Below is my interpretive poster for that earthquake. This was a much smaller earthquake, but still may have contributed slightly. Coulomb modeling might help, but that would only produce estimates of stress change. 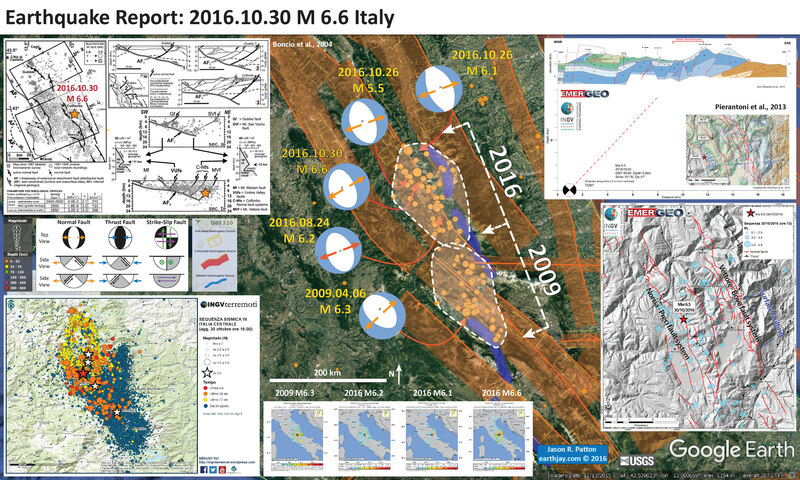 In 2015 November, there was a strike slip earthquake even further to the north. It seems improbable that this earthquake would have directly affected the fault to encourage rupture for the current swarm. Here is my Earthquake Report for the November earthquake. In this region, there was a subduction zone earthquake that generated ground deformation and a tsunami on 2007.04.10. Below is some information about that earthquake and tsunami. 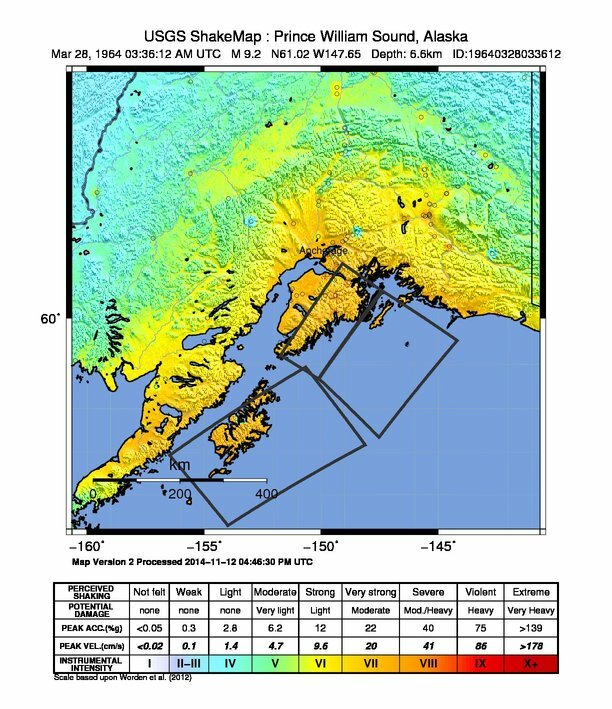 Here is a map from the USGS that shows the rupture area of the 2007 earthquake with a hashed polygon. The epicenter is shown as a red dot. 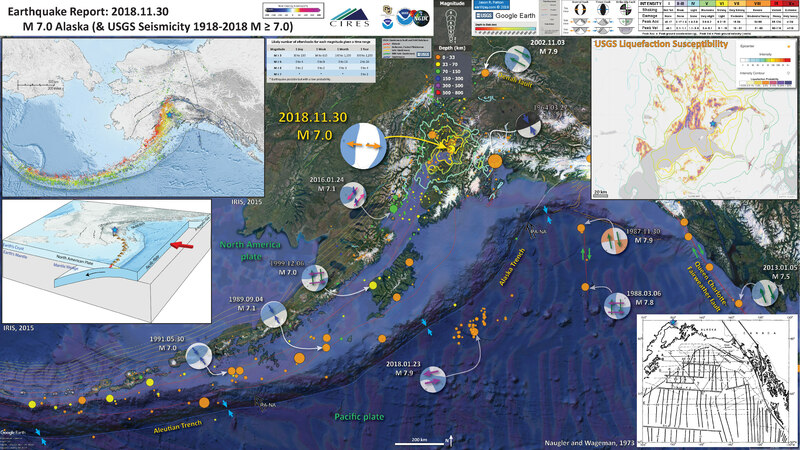 The USGS preliminary analysis of the tsunami is here. I include their text as a blockquote below. 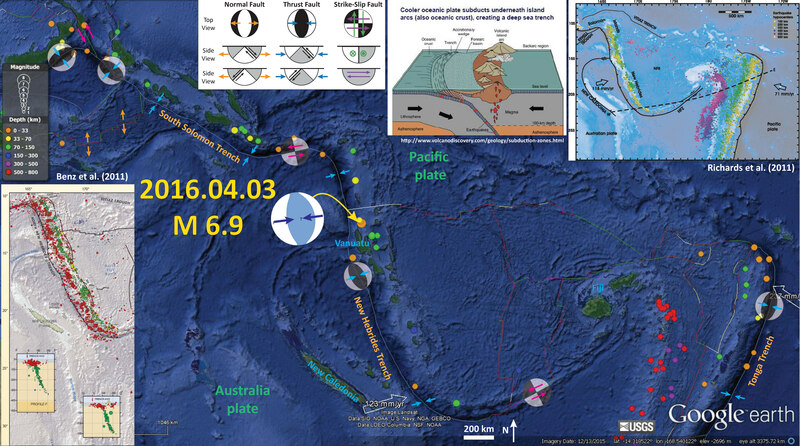 The M=8.1 earthquake that occurred in the Solomon Islands on April 1, 2007 (UTC), was located along the Solomon Islands subduction zone, part of the Pacific “Ring of Fire”. A subduction zone is a type of plate tectonic boundary where one plate is pulled (subducted) beneath another plate. For most subduction zones that make up the western half of the Ring of Fire, the Pacific plate is being subducted beneath local plates. In this case, however, the Pacific plate is the overriding or upper plate. 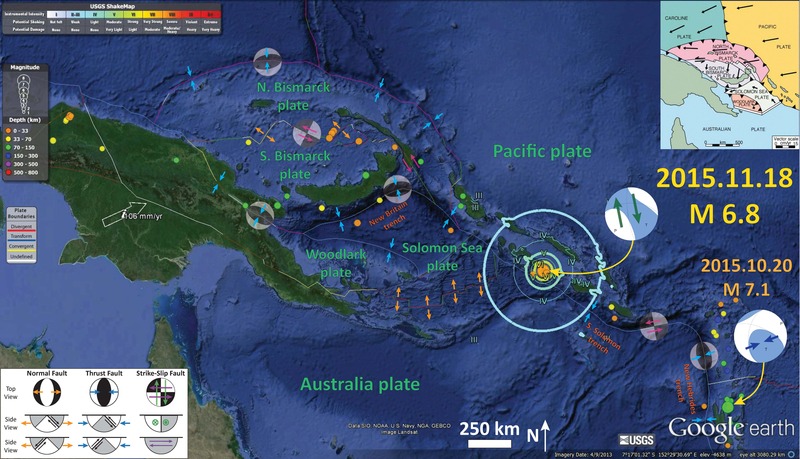 There are three plates being subducted along the Solomon Islands subduction zone: the Solomon Sea plate, the Woodlark plate, and the Australian plate (see figure below). A spreading center separates the Woodlark and Australian plates. More detailed information on the plate tectonics of this region can be found in Tregoning and others (1998) and Bird (2003). I put together this map to show how the New Britain and Solomon trenches meet. Earthquakes along the New Britain trench have principal stress aligned perpendicular to the New Britain trench and earthquakes along the Solomon trench have principal stresses aligned perpendicular to the Solomon trench due to strain partitioning in the upper plate. I provide more links and explanations about these earthquakes on this page. While I was returning from my research cruise offshore of New Zealand, there was an earthquake offshore of Japan in the region of the 2011.01.11 M 9.0 Tohoku-Oki Earthquake. Japan is one of the most seismically active regions on Earth. Below is a series of earthquake reports for the region of Japan. Here is the USGS website for this M 6.9 earthquake. Here are the web pages that I put together as material for my research cruise. 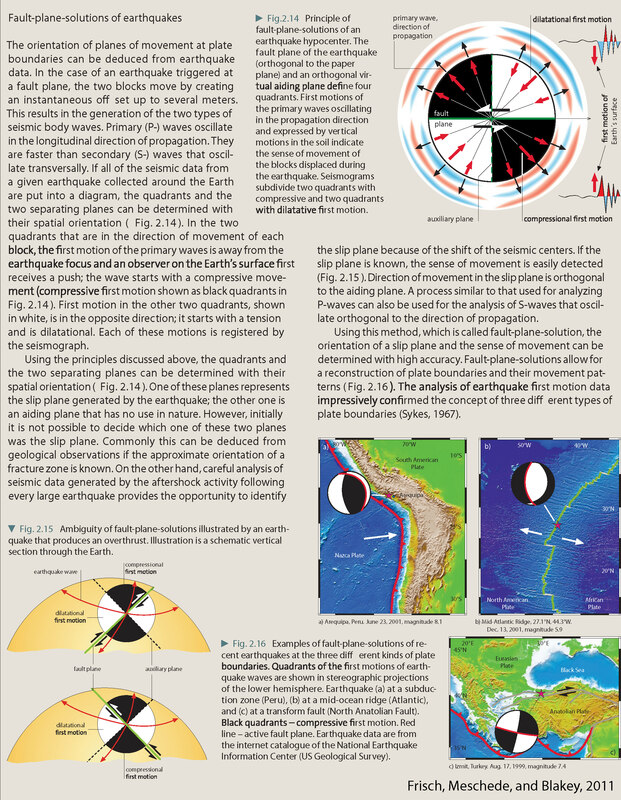 Here is my interpretive poster for the extensional earthquake that is in the upper North America plate. This earthquake has a shallow depth and produced a small tsunami run-up. I include two versions: (1) the first one has seismicity from the past 30 days and (2) the second one includes earthquakes with magnitudes M ≥ 5.5. 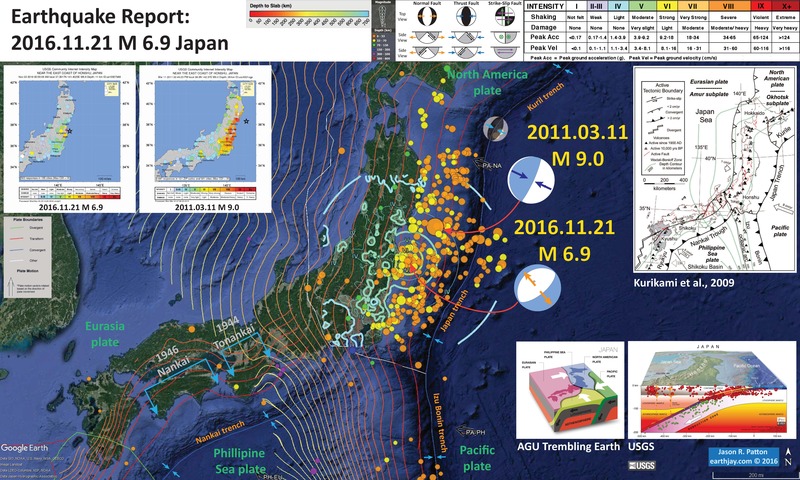 The second map is useful to view the aftershock region of the 2011.03.11 M 9.0 earthquake. The M 9.0 Tohoku-Oki Earthquake was a subduction zone earthquake, while this M 6.9 earthquake is a shallow depth extensional earthquake. 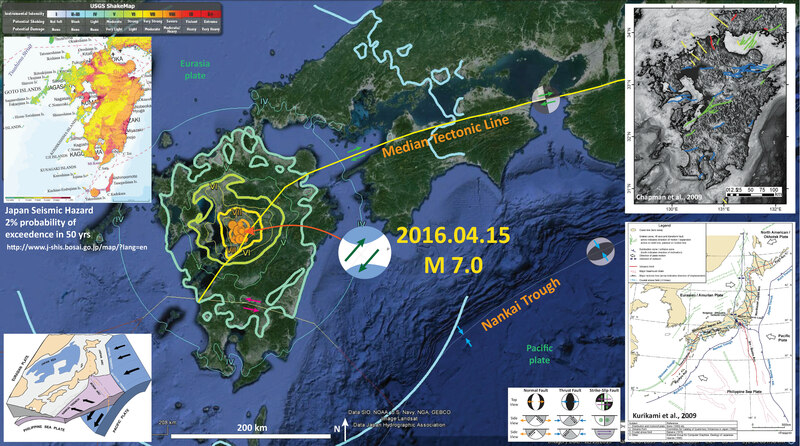 I label the location of the 1944 Tonanki and 1946 Nankai subduction zone earthquakes (both M 8.1). These earthquakes spawned decades of research that continues until this day. 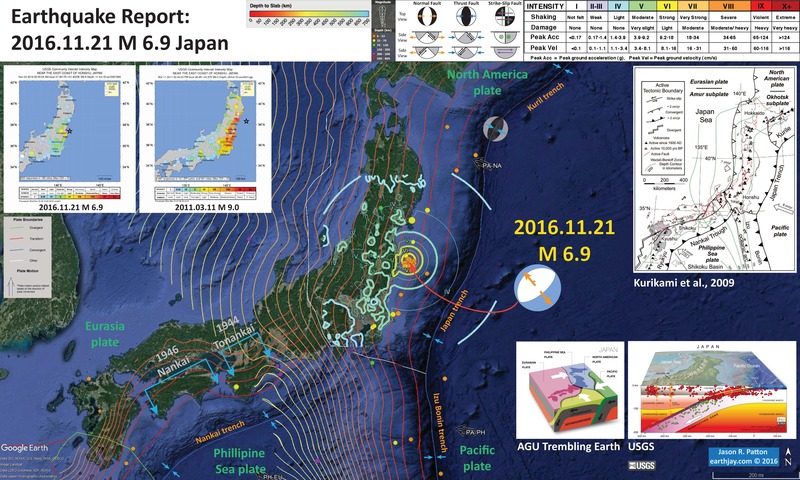 I discuss the recurrence of earthquakes in this region of Japan in my earthquake report here. 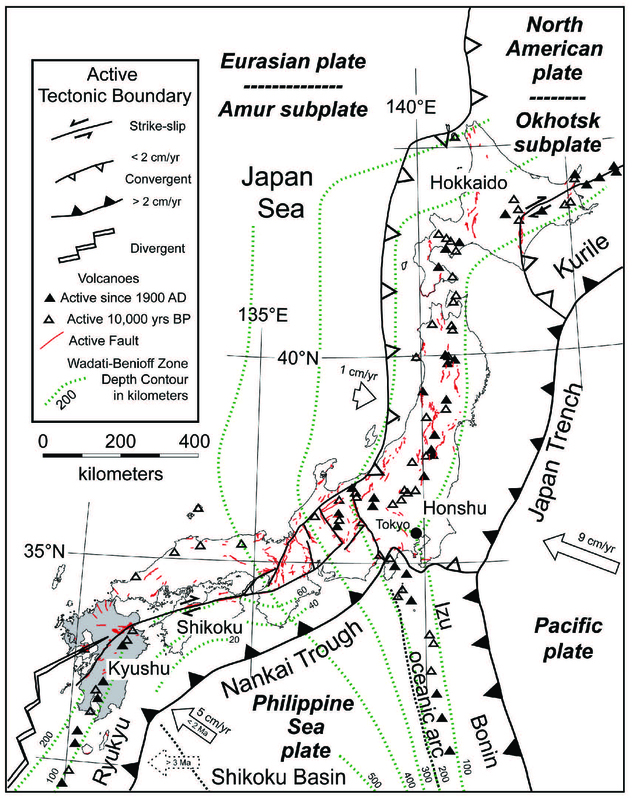 In the upper right corner is a map showing the tectonics of the region (Kurikami et al., 2009). I include this map below. 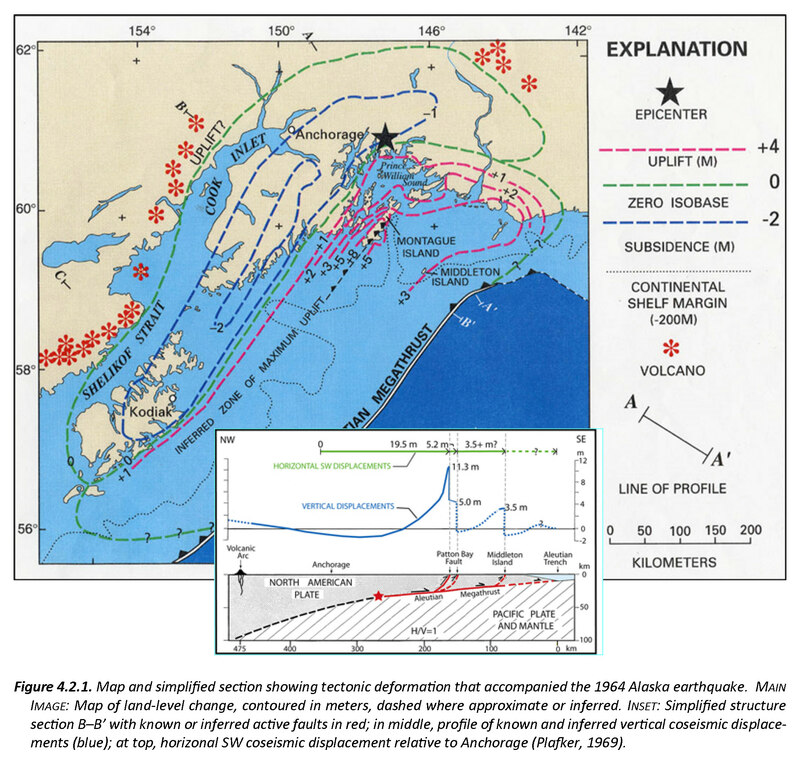 In the lower right corner is a figure from the USGS that shows seismicity along the subduction zone that forms the Japan trench. 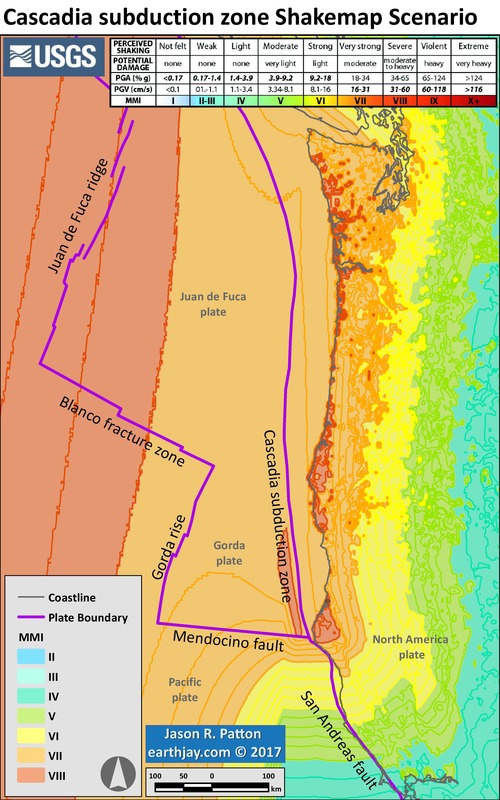 To the left of the cross section shows a low angle oblique view of the plate configuration in this region (from AGU). In the upper left corner is a comparison of the USGS “Did You Feel It?” report maps. 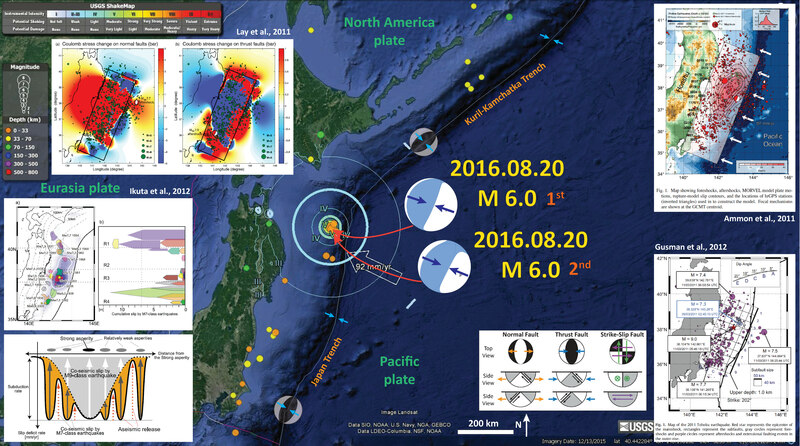 The map on the right is from the M 9.0 Tohoku-Oki earthquake and the map on the left is from this M 6.9 earthquake. Here is the upper figure showing the tectonic setting (Kurikami et al., 2009). I include their figure caption as a blockquote. Active faults in southwest Japan from the Active Fault Research Centre’s active fault database (http://www.aist.go.jp/RIODB/activefault/cgi-bin/index.cgi). The faults are color coded by sense of movement (green = dextral; blue = normal, red = reverse, yellow = sinistral). Here is another figure showing the tectonic setting (Kurikami et al., 2009). I include their figure caption as a blockquote. Current tectonic situation of Japan and key tectonic features. The upper slope of the accretionary prism for this part of the subduction zone that forms the Japan trench has well developed normal faults. Tsuji et al. 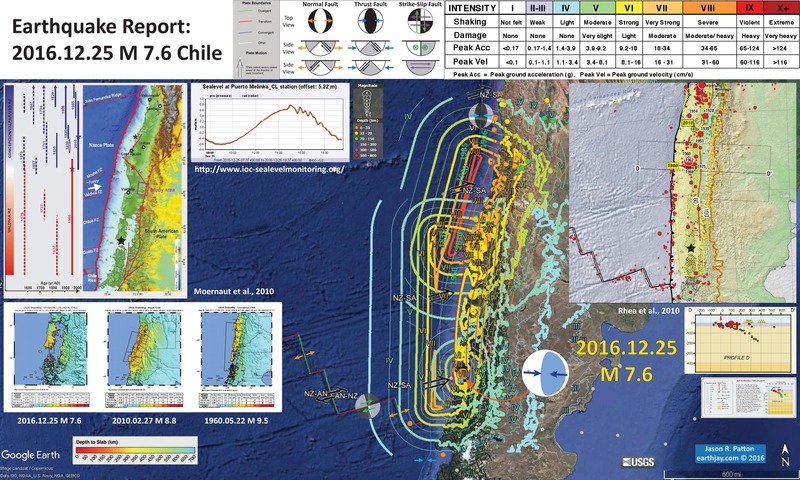 (2013) present seismic reflection profiles that for this region. I present their figure and include their figure citation below as a blockquote. The first figure is a map showing the locations of the cross sections and the locations of sites with direct observations of sea floor surface displacements (surface ruptures). 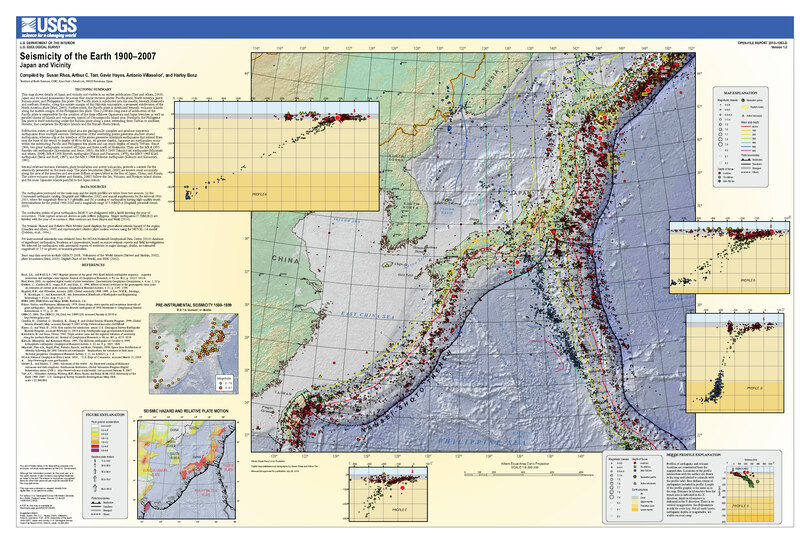 Index maps for the 2011 Tohoku-oki earthquake in the Japan Trench (JCG, JAMSTEC, 2011). (a) Blue and white contour lines are subsidence and uplift, respectively, estimated from tsunami inversion (Fujii et al., 2011), with contour intervals of 0.5 m (subsidence) and 1.0 m (uplift).Blue arrows indicate dynamic seafloor displacements observed at seafloor observatories (Kido et al., 2011; Sato et al., 2011). Red lines are locations of seismic profiles (SR101, MY101, and MY102) shown in Fig. 2. Stars indicate diving sites and are labeled with dive numbers of pre-earthquake observations (blue numerals) and post-earthquake observations in 2011 (red numerals) and in 2012 (orange numerals). Background heatflow values measured before the 2011 earthquake are displayed as colored dots (Yamano et al.,2008; Kimura et al., 2012). (b) Enlarged map around the diving sites, corresponding to the yellow rectangle in panel (a). Red dashed lines indicate seafloor traces of normal faults (i.e.,ridge structures). Yellow dashed lines indicate estimated locations of the backstop interface. The white dashed line indicates the boundary of the area of significant seafloor uplift (49 m uplift)and also the tsunami generation area (Fujii et al., 011), corresponding to the reddish-brown area in panel (a). 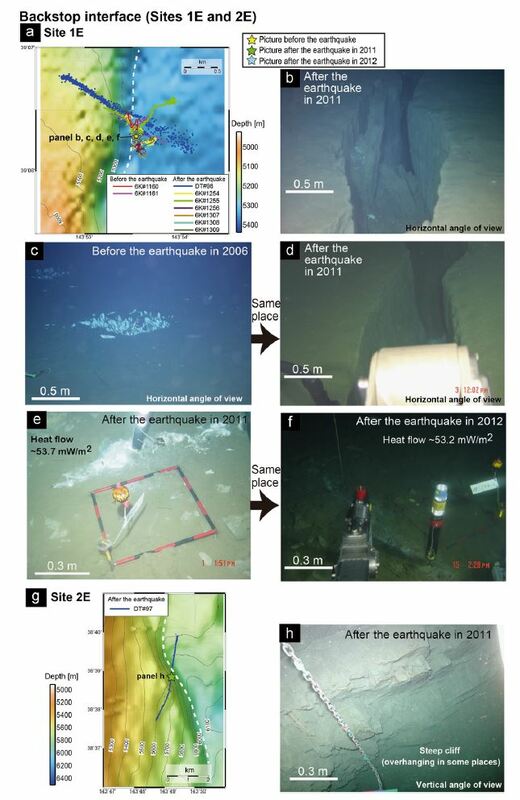 Observations made during the post-earthquake dives are described in panel(b). Reflection seismic profiles obtained in the central part of tsunami source area(line MY102 in panels f–h), at its northern edge (line MY101 in panels c–e), and its outside (line SR101 in panels a,b). Original profiles of (a) line SR101, (c) line MY101, and (f) line MY102. Composite seismic reflection profiles with geological interpretations of(b) line SR101,(d) line MY101, and (g) line MY102 (Tsuji et al.,2011). Red arrows in panel (d) and (g) indicate seafloor displacements (Ito et al.,2011; Kido et al.,2011; Sato et al.,2011). Enlarged profiles around (e) Site 2W on line MY101, and (h) Site 3W on line MY102. Here is a figure from Tsuji et al. (2013) that shows some images of the seafloor. These show views of ruptured sea floor. (a) Diving tracks on seafloor bathymetry at Site 2W. 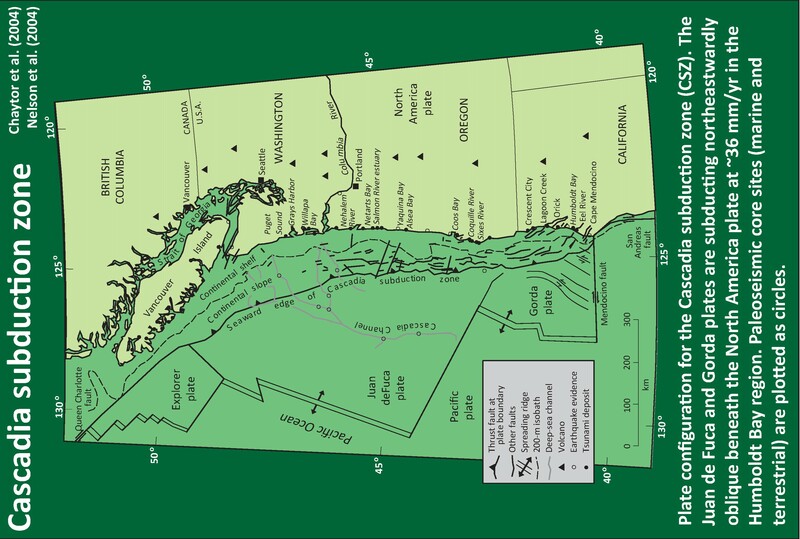 Stars indicate locations of seafloor photographs displayed in panels (b)–(f). (b) Photograph of an open fissure representative of those commonly observed after the earthquake. (d) An open fissure was observed during post-earthquake observations where (c) no fissure had been before the earthquake. (g,h) Photographs taken in (g) 2011 and (h) 2012 showing the heat flow measurements being made at the same location by SAHF probe. (a) Diving tracks on seafloor bathymetry at Site 1E. The white dashed line indicates the location of the interpreted fault. Stars indicate locations of seafloor images displayed in panels(b)–(f). (b) Photograph of an open fissure representative of those commonly observed after the earthquake. (d) Open fissure seen during post-earthquake observations where (c) a clam colony (1 m wide) was observed before the earthquake. (e,f) Photographs taken in (e) 2011 and (f) 2012,showing the heatflow measurements at the same location by SAHF probe. (g) Dive track on seafloor bathymetry at Site 3E. The star indicates the location of (h) a seafloor photograph showing a steep cliff. Here is an explanation for the extension generated during the 2011 earthquake. 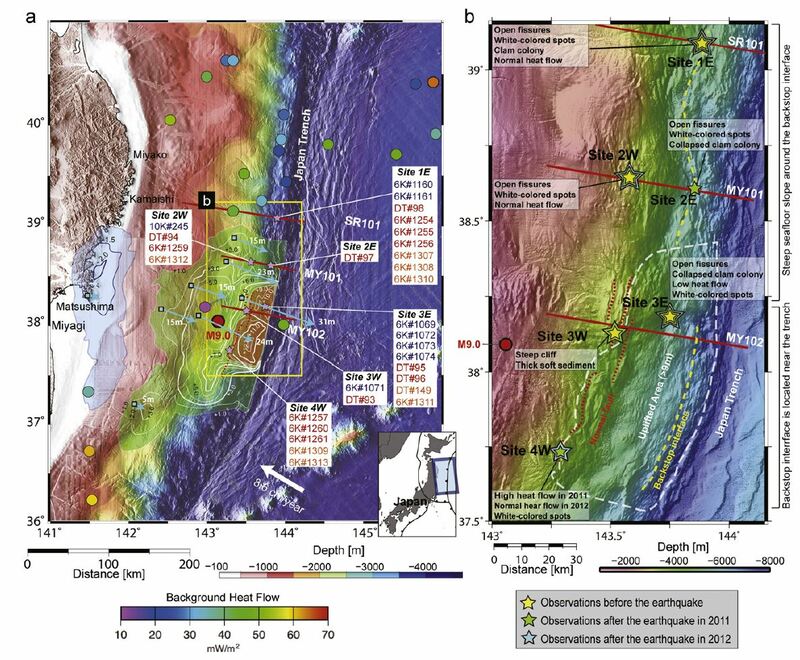 Schematic images of coseismic fault ruptures and the tsunami generation model (a) at the northern edge (and outside) and (b) in the central part of the tsunami source area. Soft slope sediments covering the continental crust are not shown in these images. (a) Collapse of the continental framework occurred mainly at the backstop interface north of the large tsunami source area. (b) Anelastic deformation around the normal fault allowed large extension of the overriding plate in the tsunami source area. These are some observations posted by the Pacific Tsunami Warning Center. There continue to be aftershocks from the 2011.03.11 M 9.0 Tohoku-Oki Earthquake. Here is a page that I put together where I present several slip models from the 2011 earthquake. In 2013 October, 2015 February (and a second report here), and 2016 August there was a series of earthquakes along the northern part of the 2011 rupture zone, in a region of low slip. 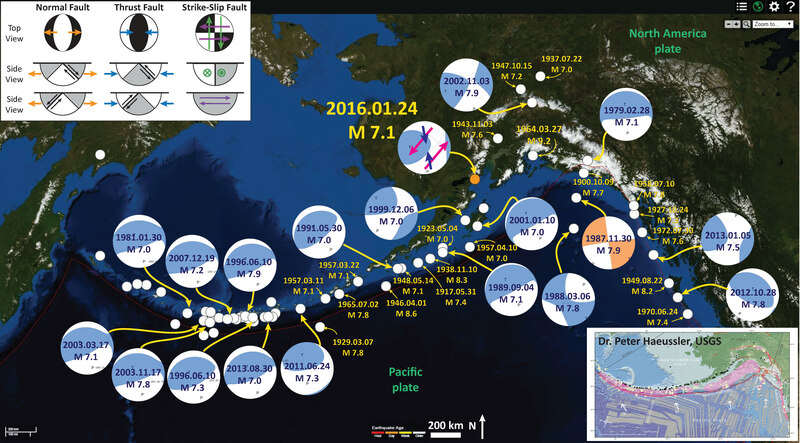 Below is a poster that shows the February 2015 earthquakes in relation to the Ammon et al. (2011) slip model. Below is an interpretive poster from the August 2016 earthquakes. 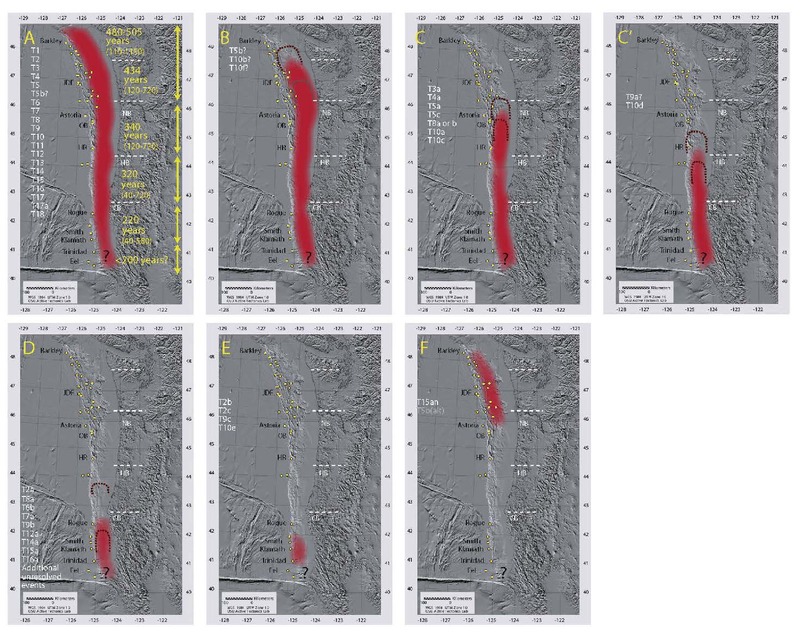 I include some inset figures that help us visualize some possible reasons why there is seismicity in this region. In the upper right corner I include a map that shows seismicity before and after the M 9.0 Tohoku-Oki earthquake. Ammon et al. (2011) invert teleseismic P waves and broadband Raleigh waves with high-rate GPS data to constrain their slip model. Slip magnitude in meters is represented by shades of red. They also plot the source time function plot. Source time function plots show us the amount of energy that is released during an earthquake and how that energy release varies with time. In the lower right corner I include a map that shows the seismicity in the region before and after the M 9.0 earthquake (Gusman et al., 2012). In the lower left corner I include two figures from Ikuta et al. (2012). 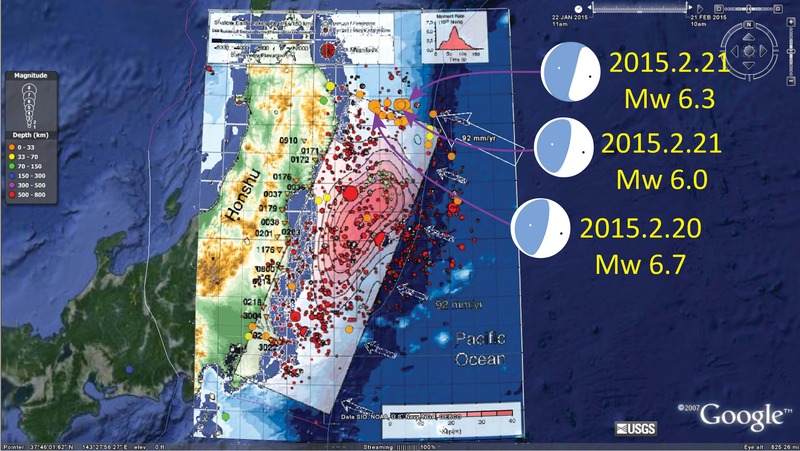 The upper panel shows how the 2011 slip region compares to slip from previous M 7 class earthquakes. 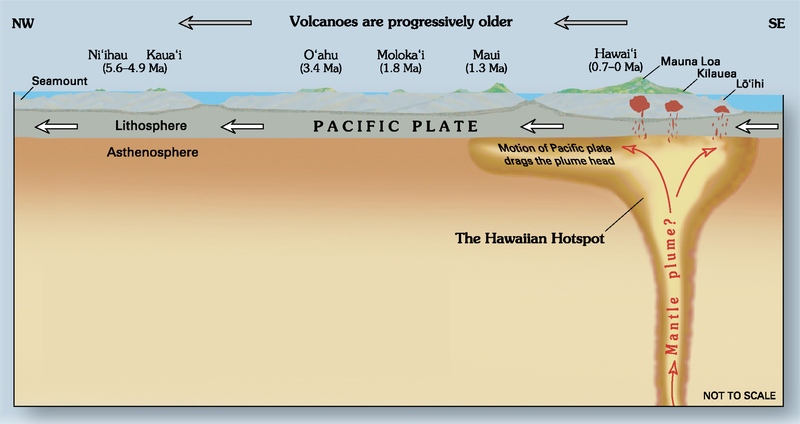 The lower panel shows the slip deficit for this part of the subduction zone. Basically, this is a way of viewing how much plate convergence might be expected to contribute to earthquake slip over time. In the upper left corner I include a figure from Lay et al. (2011) that shows the coulomb stress changes due to the 2011 earthquake. Basically, this shows which locations on the fault where we might expect higher likelihoods of future earthquake slip. 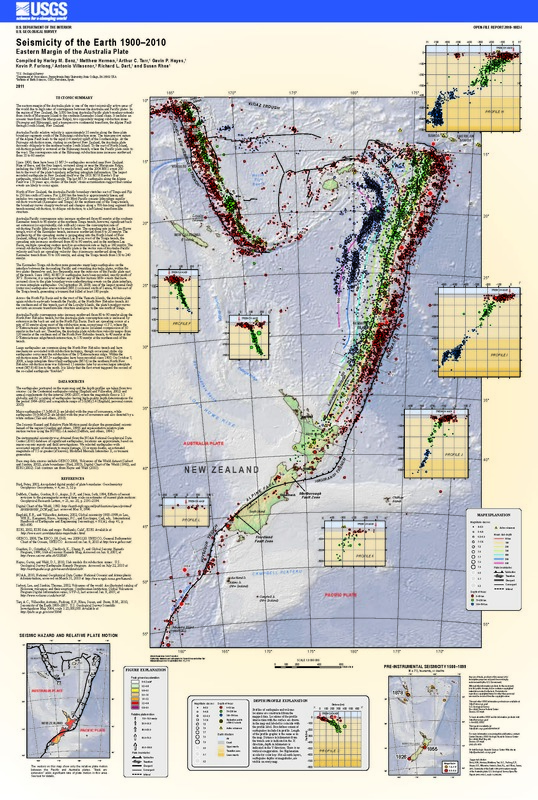 Here is a USGS poster than summarizes the earthquake history and plate geometry for this region. This is the USGS Open File Report 2010-1083-D (Rhea et al., 2010). I put together an animation that shows the earthquake epicenters in Japan from 1900-2016/04/01. I include earthquakes with magnitude ≥ 6.0. 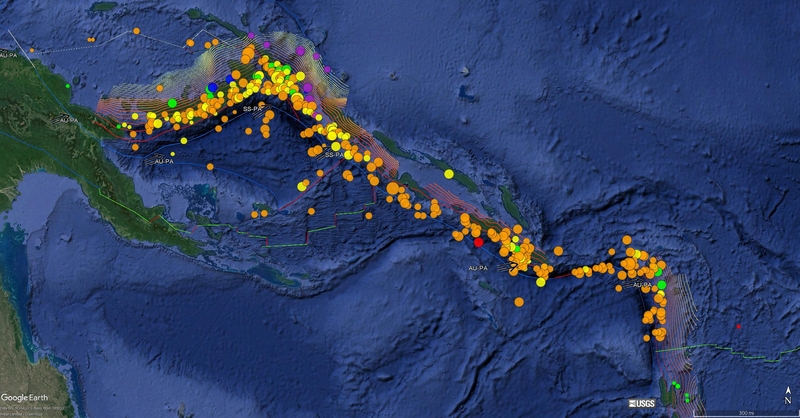 Below is a screenshot of all these earthquakes, followed by the video. Here is the kml that I made using a USGS earthquake query. Here is the query that I used. 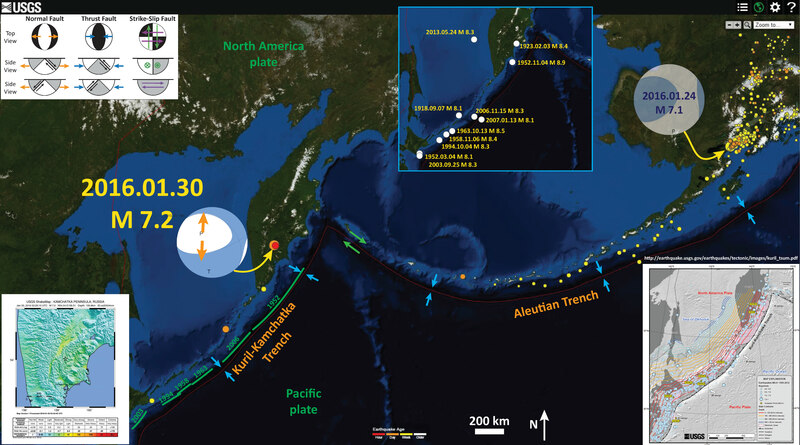 The animation has an additional cross section showing the Japan trench, where the 2011/03/11 Tohoku-Oki M 9.0 subduction zone earthquake occurred. Here is a summary of the observations made following that 2011 earthquake. Chapman et al., 2009. Development of Methodologies for the Identification of Volcanic and Tectonic Hazards to Potential HLW Repository Sites in Japan –The Kyushu Case Study-, NUMO-TR-09-02, NOv. 2009, 192 pp. Kurikami et al., 2009. Study on strategy and methodology for repository concept development for the Japanese geological disposal project, NUMO-TR-09-04, Sept. 20-09, 101 pp. Ohmi, S., Watanabe, K., Shibutani, T., Hirano, N., and Nakano, S., 2002. The 2000 Western Tottori Earthquake—Seismic activity revealed by the regional seismic networks in Earth Planets Space, v. 54, p. 819-830. Rhea, S., Tarr, A.C., Hayes, G., Villaseñor, A., and Benz, H.M., 2010. Seismicity of the earth 1900–2007, Japan and vicinity: U.S. Geological Survey Open-File Report 2010–1083-D, scale 1:6,000,000. Tsuji, T., Kawamura, K., Kanamatsu, T., Kasaya, T., Fujikura, K., Ito, Y., Tsuru, T., and Kinoshita, M., 2013. 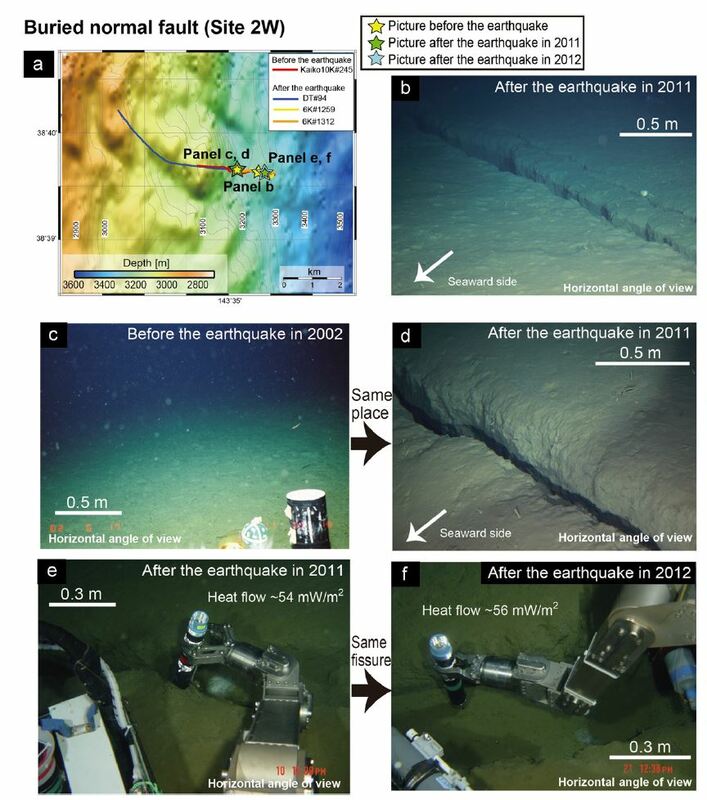 Extension of continental crust by anelastic deformation during the 2011 Tohoku-oki earthquake: The role of extensional faulting in the generation of a great tsunami in Earth and Planetary Science Letters, v. 364, p. 44-58. 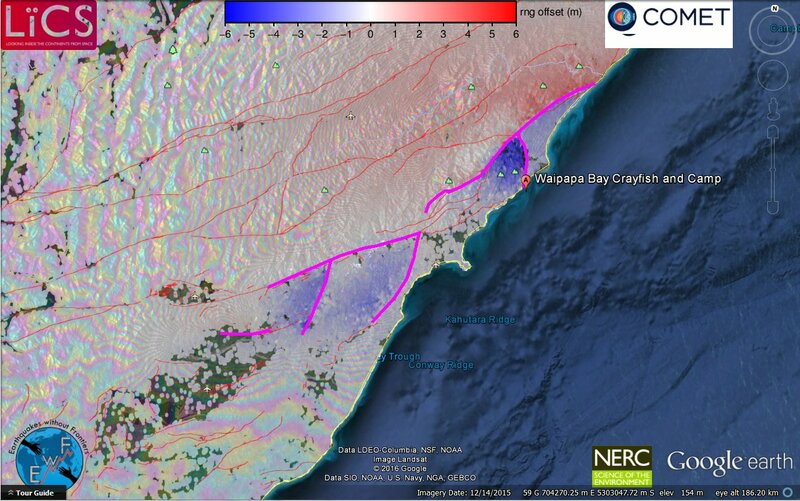 This is the first of several posts about a complex earthquake series that happened along the northern end of the South Island in New Zealand. I was at sea on the R/V Tangaroa collecting piston cores offshore along the Hikurangi subduction zone this month. While I was at sea, there was a large earthquake, probably along one of the upper plate faults in this region. I present a simple interpretive poster below and will follow up with several more posts as I find more time between my other responsibilities (I have been gone at sea for two weeks, so I have lots of catch up work to do). This earthquake series is in a complicated part of the Earth where a subduction plate boundary turns into a transform plate boundary. There was a tsunami warning for the nearby coasts, but not for a global tsunami. 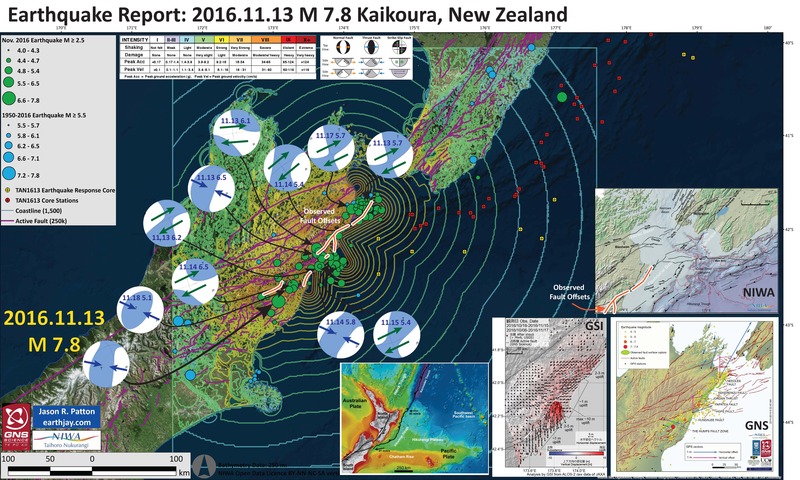 Geonet is a website in New Zealand that is a collaboration between the Earthquake Commission and GNS Science. 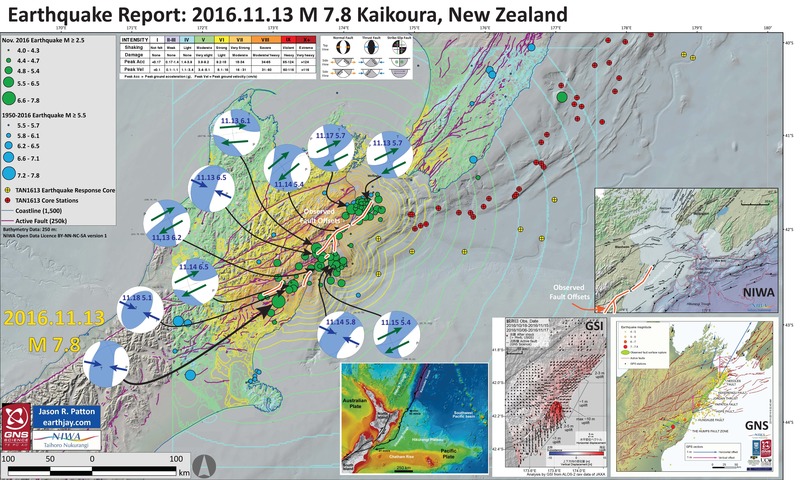 Here is the website at Geonet where one can find the most up to date observations and interpretations about this M 7.8 Kaikoura Earthquake series. Below is a map that I prepared that shows the earthquakes (magnitude M ≥ 2.5) for the month of November as green circles (diameter represents earthquake magnitude). I also plot earthquakes with magnitudes M ≥ 5.5 from the period of 1950-2016. These are from the USGS NEIC, so the regional network run in New Zealand may have a larger number of earthquakes. I present two maps, one with a 250 m resolution bathymetric grid as a base and one with a Google Earth satellite based map as a base. This is not an official GNS nor NIWZ figure, but they were major supporters of the TAN163 cruise that I participated on, so we can attribute the core data to these organizations. I placed the moment tensors for the larger earthquakes during this time period since the M 7.8 earthquake. The main earthquake is a compressional earthquake, probably on an upper plate fault. 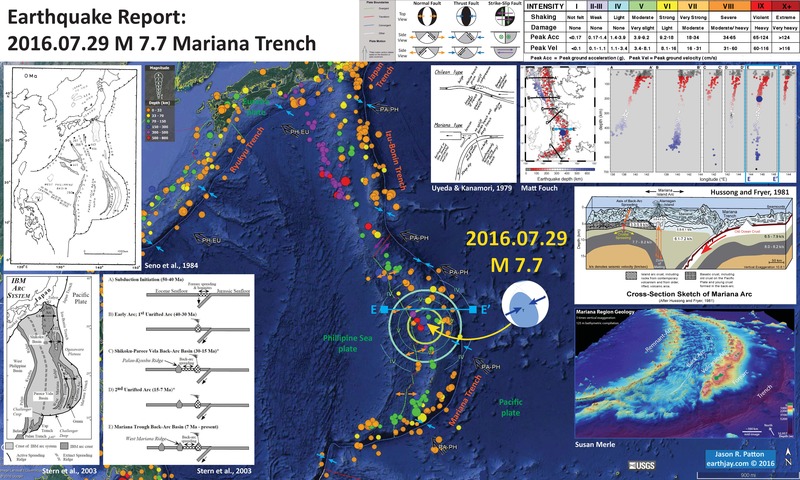 The M 7.8 earthquake triggered slip on other thrusts and some strike-slip faults in the region. Surface deformation measured using Interferometric Synthetic Aperture Radar (INSAR) is localized, supporting the upper plate rupture interpretation. Slip on the thrust during the 7.8 is estimated to be about 10 meters, which is also the maximum slip on some of the strike-slip fault systems. There have been some excellent photographs of the fault rupture (I will include these in a later post). Most of the large earthquakes are strike-slip, but there are some connecting faults that show thrust mechanisms. I also show the regions of different faults that have been observed to have surface ruptures. After the earthquake, we changed our plans to conduct some post-earthquake response analyses. 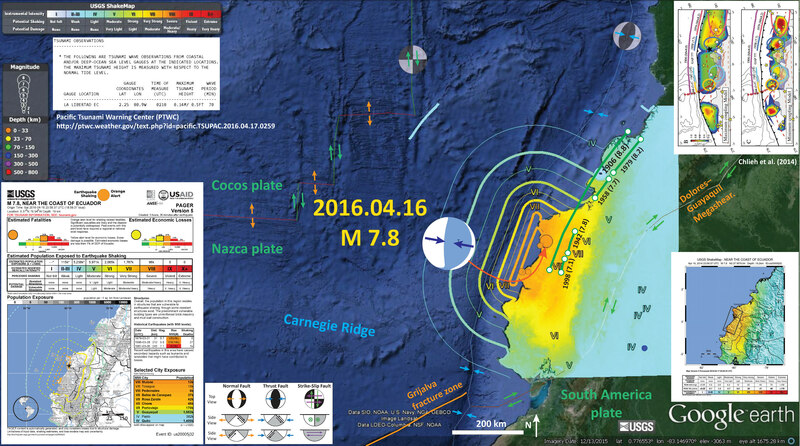 We collected additional cores to search for sedimentary evidence of the M 7.8 earthquake. We also collected sub-bottom profile and bathymetric data to search for seafloor exposed fault rupture. The cores we collected for our general study are shown as red cross-dots. The cores we collected as the earthquake are plotted as yellow cross-dots. In the upper right corner is a map from NIWA (Phil Barnes). This map shows some of the major faults in this region. I placed the observed fault offsets on this map as orange lines. This map is on the NIWA website, but I will find the Barnes publication this came from and post that in a follow up web page. In the lower right corner is a map from Geological and Nuclear Sciences (GNS) in Māori: Te Pū Ao. This map shows the regional faults and where there have been observations of surface rupture. 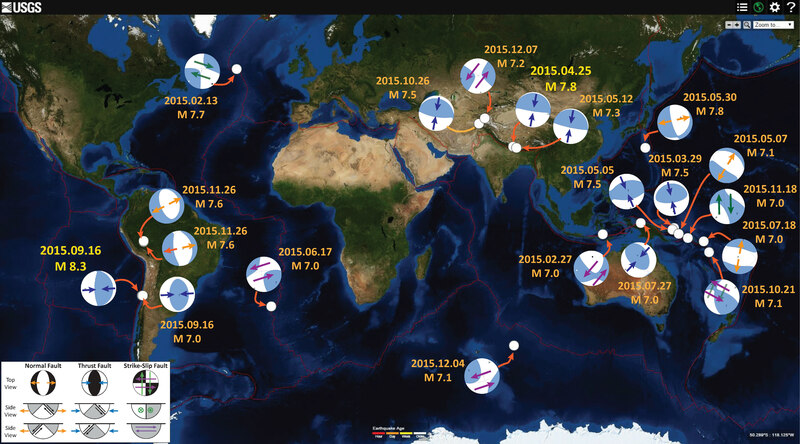 The coseismic (during the earthquake) Global Positioning System (GPS) observations. Earthquakes are also plotted. To the left of that is a figure from the Geospatial Information Authority of Japan (GSI). This is a summary figure showing modeled uplift as compared to InSAR analysis results. Note how localized the deformation is. I will present and discuss the analyses that went into this figure in a follow-up report. To the left of that is a generalized tectonic map of the region. Here are the USGS websites for the large earthquakes plotted in the map above. Here is an image of the seismograph as recorded by the Humboldt State University, Department of Geology, Baby Benioff seismometer. Here is a fantastic visualization of the ground motions, as recorded by USGS seismometers, from the seismic waves as they propage through the earth as a result of the main earthquake. Here is a link to the mp4 video embedded below (8 MB mp4). Here is the USGS Seismicity of the Earth map for this region (Benz et al., 2010). Click on the map for the pdf of this report (66 MB pdf). Here is 10 MB jpg file. Initial recon overflights report that there have been over 100,000 landslides from this earthquake. Below is a map that shows a different analysis that people are conducting. There will be more. Here is one of the early InSAR results from COMET. I will present more of these is a follow-up report. Here is a cool comparison animated gif showing before and after the earthquake. This is an animated gif showing photos taken by Casey Miln and Andrew Spencer. Here is a comparison satellite image from Chris Milliner. Here is a video of the Kekerengu fault rupture. This is the yt link for the embedded video below. Here is an mp4 link. Here is a video of the Papatea fault rupture. This is the yt link for the embedded video below. Here is an mp4 link. 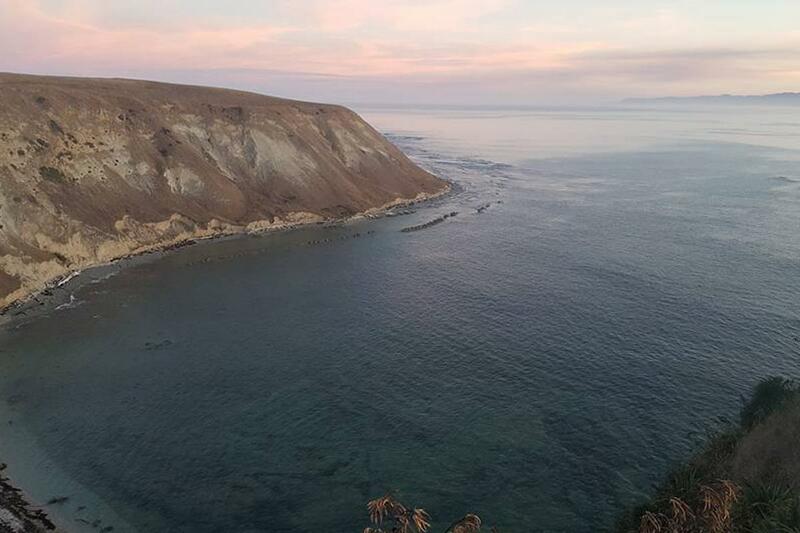 Here is a video of the Papatea fault and uplifted coast. This is the yt link for the embedded video below. Here is a video of the earthquake and aftershocks. This is the yt link for the embedded video below. 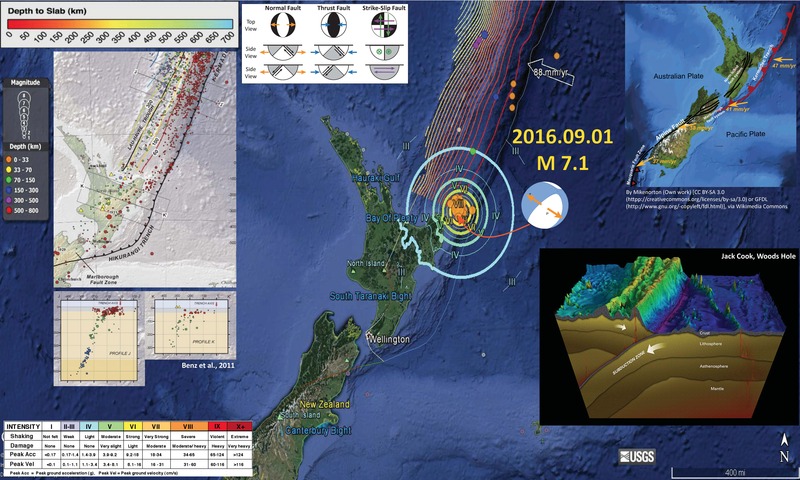 Here is a video showing a simulation of the M 7.8 Kaikoura earthquake. This is the yt link for the embedded video below. 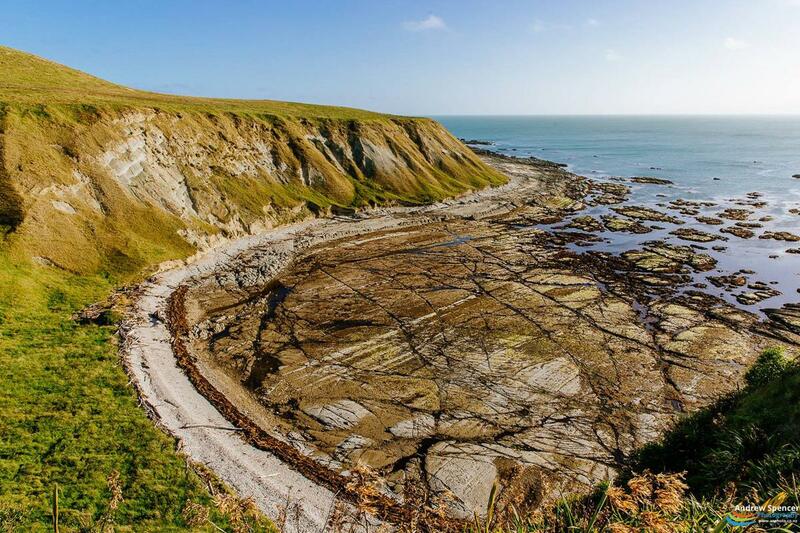 Here is a video of the road to Kaikoura. This is the yt link for the embedded video below. Furlong, K., 2007. 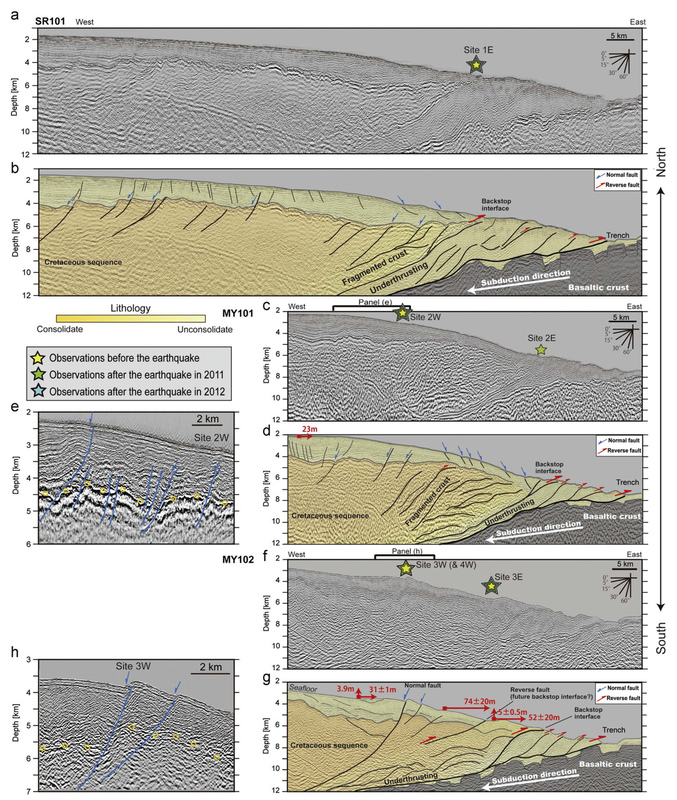 Locating the deep extent of the plate boundary along the Alpine Fault zone, New Zealand: Implications for patterns of exhumation in the Southern Alps in Geology, v. 434, p. 1-14.